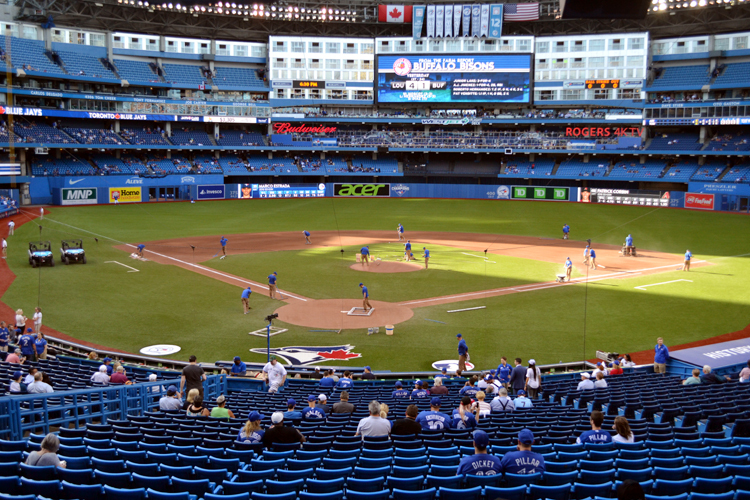 I try to visit Rogers Centre every two years, which means that after not seeing a game at the stadium since the spring of 2013, I was way overdue to travel to Toronto. 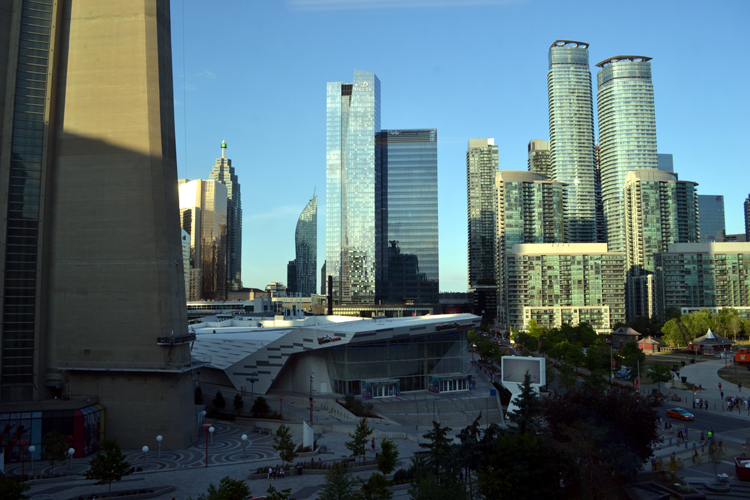 I opted to take the train to Toronto instead of drive, as I was swamped with work and sitting on the train would allow me to get caught up on some writing during the trip. 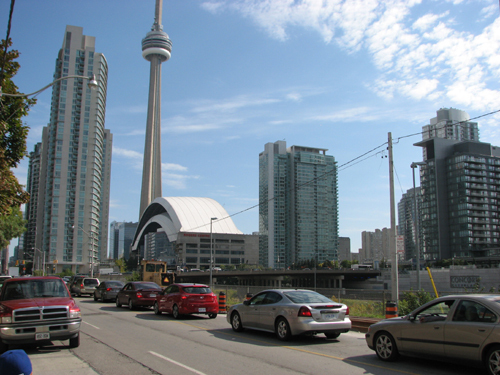 The VIA Rail train arrives at Toronto’s Union Station, which is the city’s central travel hub downtown, and I was pleased to see that I could actually access the Delta through a series of walkways and pedestrian bridges. Anyway, I arrived super early, as I was hoping to get into my room before check-in, and I wanted to give myself some time to check out the new hotel and tour the area around it, too. 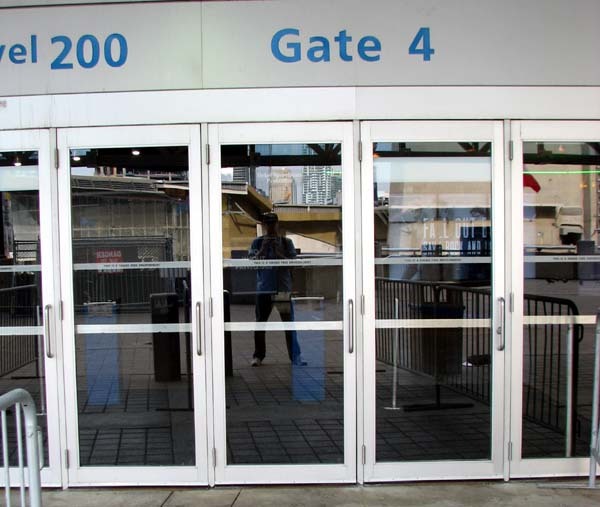 When I passed through a walkway from Union Station to the Delta, I found my path blocked by a large group of men stretching on the floor — I quickly noticed that they were all wearing Vancouver Whitecaps uniforms, and were obviously doing their pregame stretching routine at the hotel before playing Toronto FC in Major League Soccer action later that afternoon. 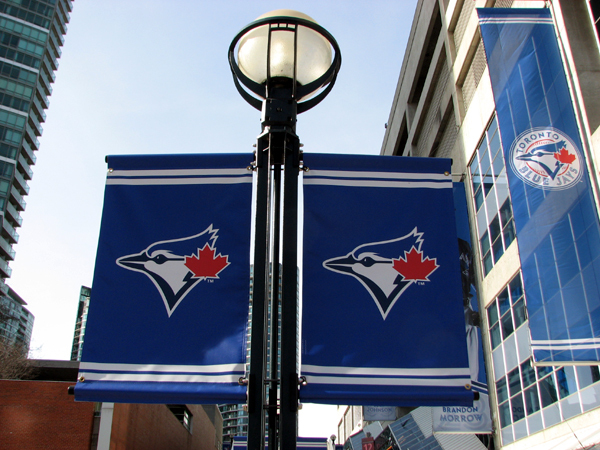 Always a good sign when a major league sports franchise is staying in the hotel you’re visiting, right? 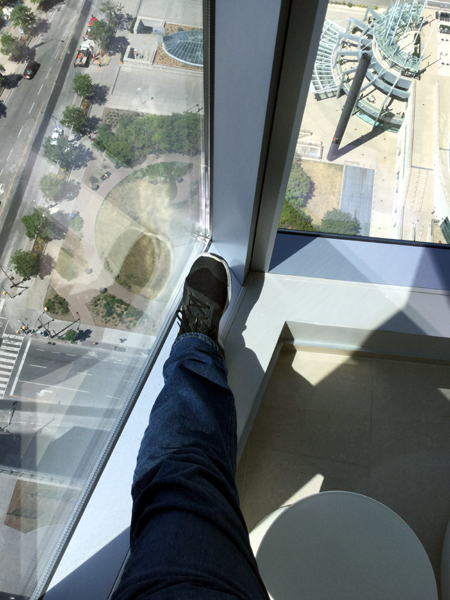 My early arrival meant that my room wasn’t quite ready, so the front desk clerk asked if I wanted to visit the exclusive Club Lounge on the 46th floor while I waited. Umm, that was a no brainer! With the exception of an attendant and a couple people working on laptops, the lounge was empty, so I toured around it and learned that there were complimentary drinks and snacks — including red licorice, which I may or may not have overindulged in. 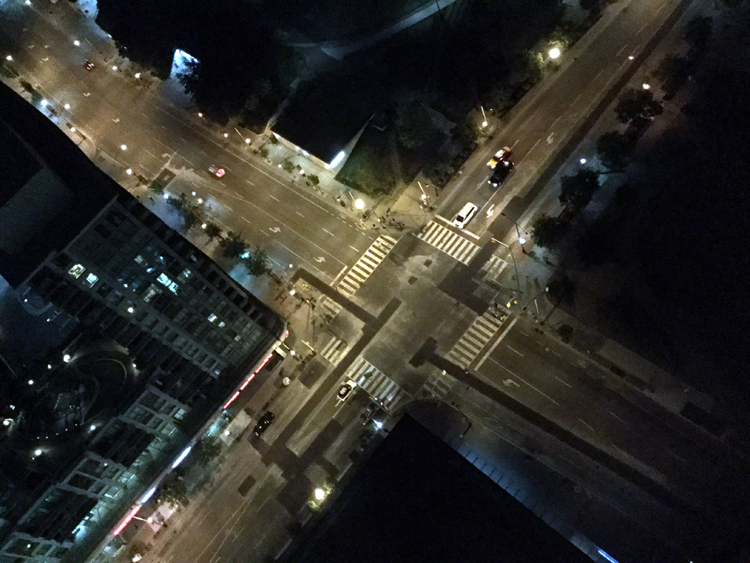 It was cool being so high off the ground; I don’t think I’ve ever stayed in a hotel so tall, so I had a blast looking out the floor-to-ceiling windows and identifying the sights below that I recognized. Argh. Of all the luck. As I dug in, I was surprised at the lack of fries. The “poutine” label, to me, suggested that there’d be fries at the bottom of the container, but that wasn’t the case. 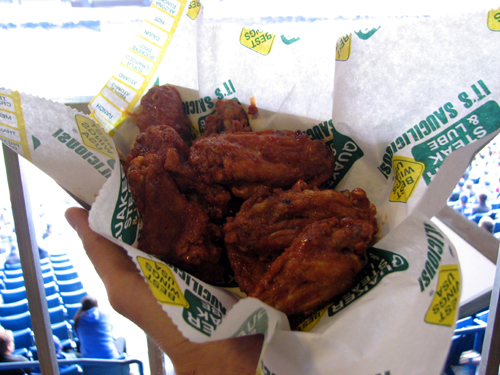 Rather, the pieces of breaded and fried cauliflower made up the bulk of the meal. 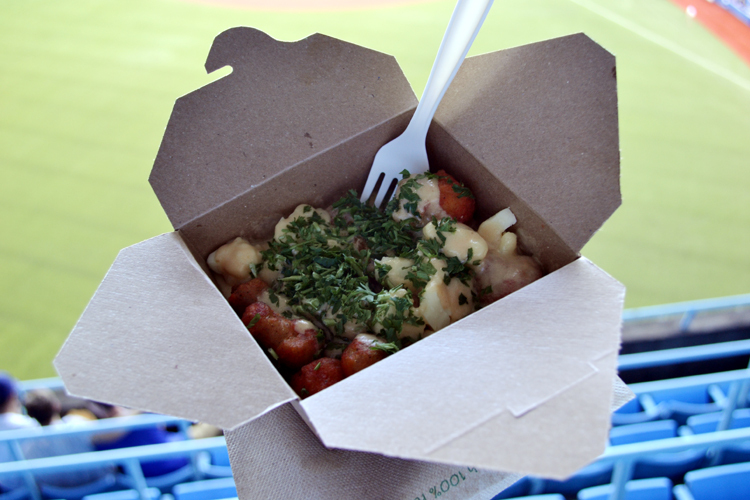 They were topped with cheese curds, buffalo sauce and fresh parsley. The verdict? It fell into the odd “good but I wouldn’t order it again” category. The fried cauliflower was definitely tasty, but I found there was a lack of variety in this meal. Soon enough, the cauliflower was soggy from the melted cheese and hot sauce, so everything sort of clumped together. I definitely appreciated the meal’s creativity, though — even if it wasn’t something I’d likely order again, it was fun to try something so unique. 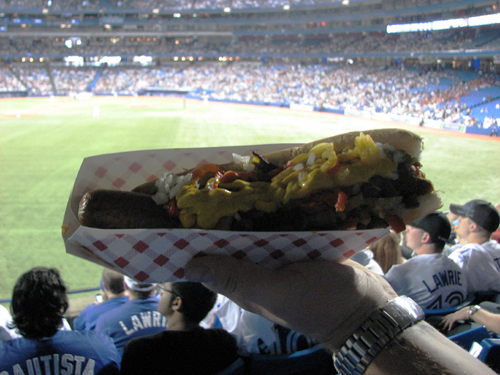 The game began as I ate, so I enjoyed watching the first inning from a section I don’t think I’d visited much in the past. 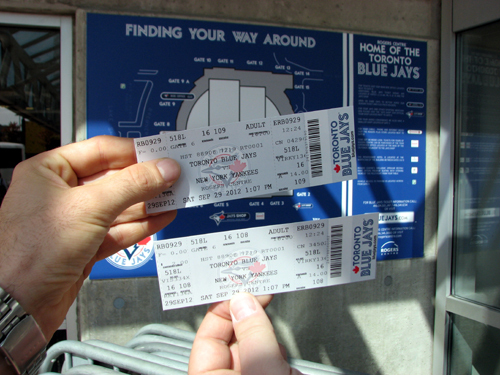 Of course, the ever-present Rogers Centre usher had to come over and check my ticket. 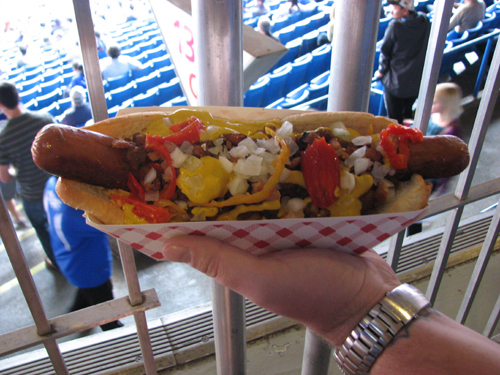 I had a ticket for a section in the 500 Level in right field, but had stopped in a nearly empty section in left field to eat. 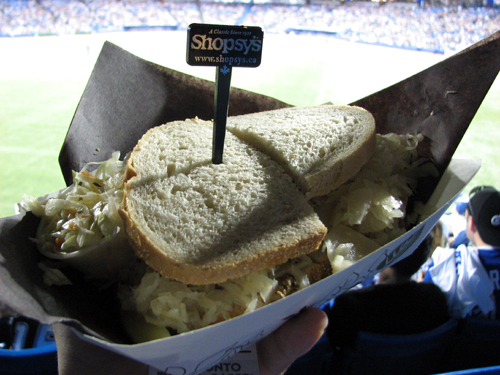 For the record, the usher “let” me stay but admonished me to leave the section as soon as I finished eating. 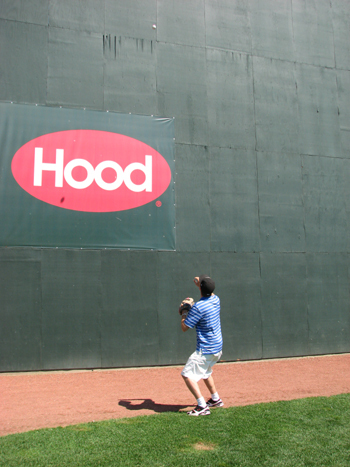 … and then decided to head over toward my seat in right field. 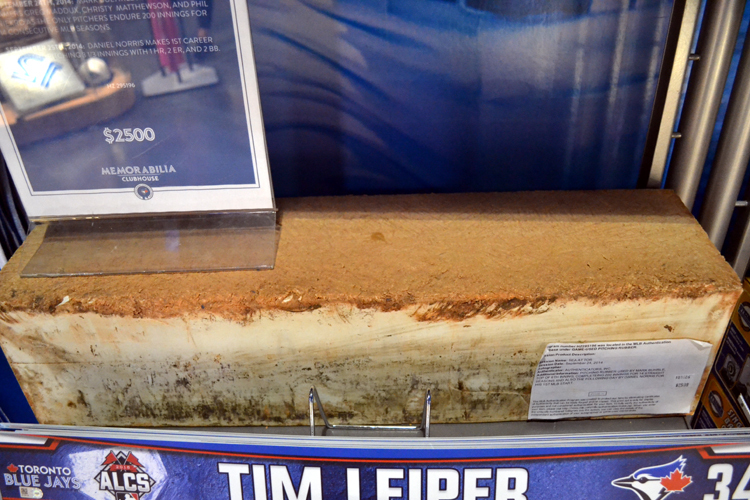 As I walked through the 500 Level concourse for the first time since 2013, I noticed a change. 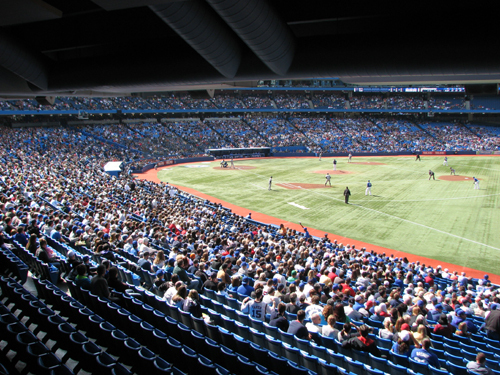 Ever since the Blue Jays became good again, the 500 Level has once again come alive. 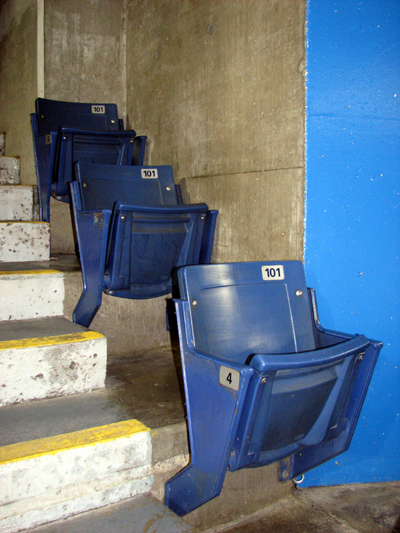 In the glory years of the team, the seats in the upper deck were often packed. 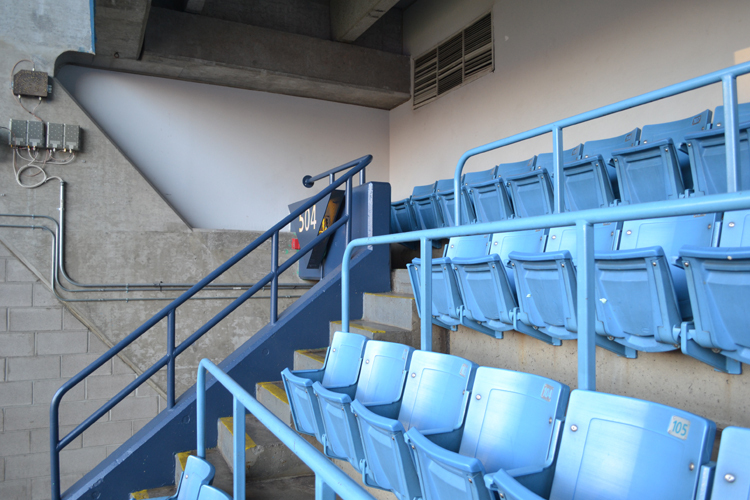 During the team’s down years, though, many sections were blocked off and several of the 500 Level concession stands remained closed, giving a bit of a ghost town feel to the sections and concourse toward the foul poles. 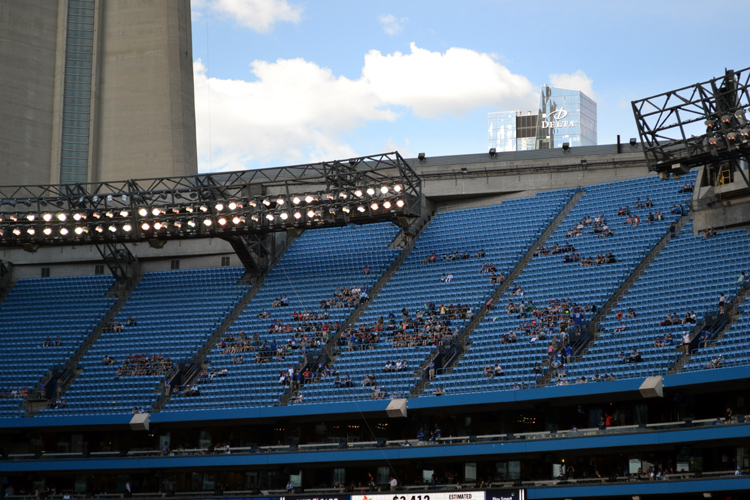 It was nice to see this part of the stadium so lively during this visit, and I imagine it’ll stay that way as long as the team continues to be competitive. 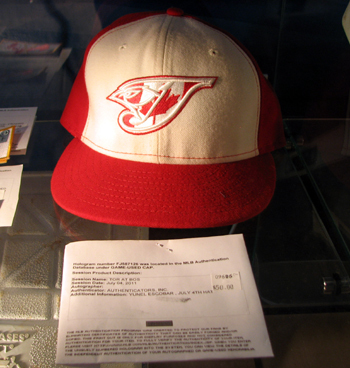 It was, as you might expect, not for sale. 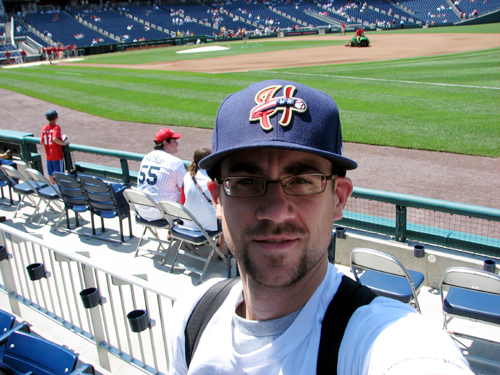 I’ll admit, though, that my visit ended before the game’s last out. 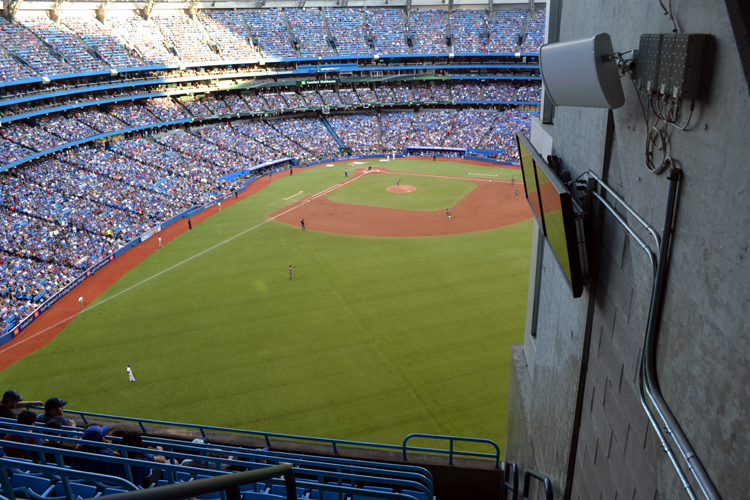 I’m not typically a fan of leaving a game early, but I ducked out of Rogers Centre a couple innings before the game was over so that I could get back to my hotel room and shoot some time-lapse images of the evening scene. Although it’s tough to beat the idea of being in the stadium, the idea of watching the sun setting over it from an awesome hotel room was pretty appealing, too. 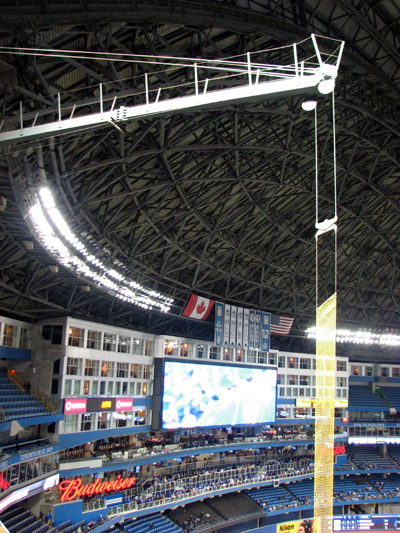 At about the midway point, you’ll see the Rogers Centre dome close, which I think looks cool. 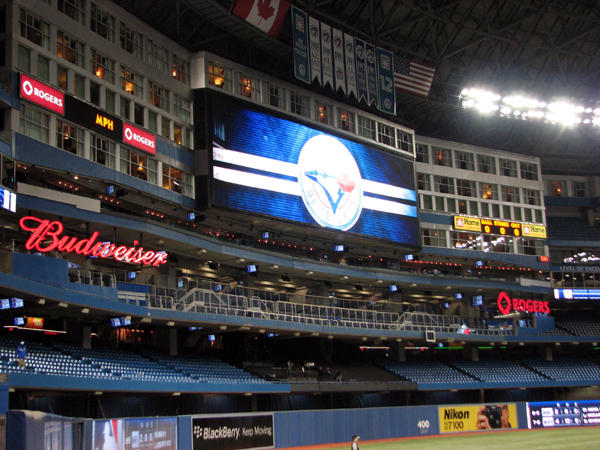 The Delta Toronto definitely provided an outstanding visit, and I wholeheartedly recommend it for baseball fans. 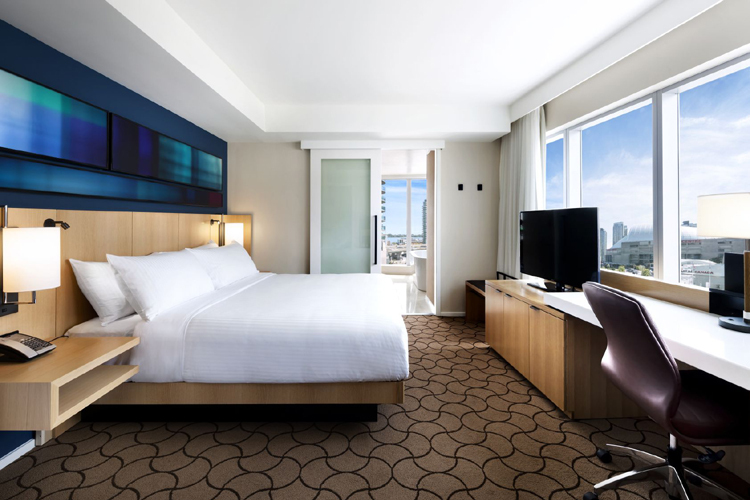 You can’t beat the view or the easy proximity to a ton of major attractions, as well as the impeccable guest rooms and top-notch service. 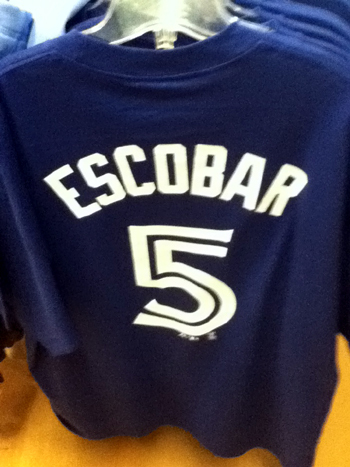 It’ll definitely be my choice when I visit Toronto again to see the Blue Jays. 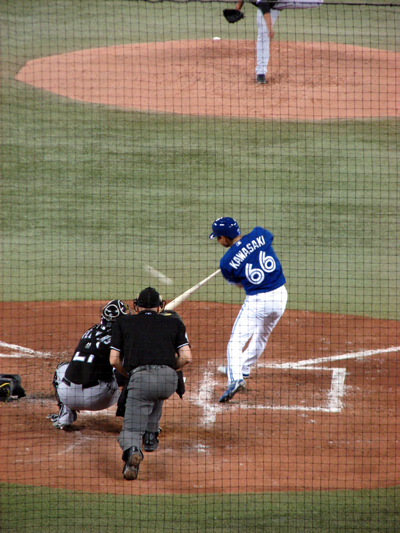 The day of my first Blue Jays game of 2013 was long, but awesome. 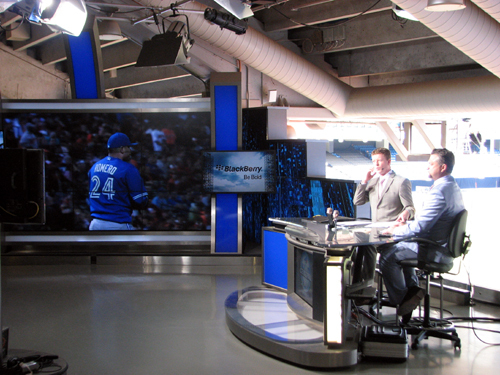 It included an exceptional hotel, tasty chicken wings, fun explorations of Rogers Centre and a ball during batting practice. That’s the Cole’s Notes version, but if you want to read, oh, about 3,000 more words on the day, please take a look at this link. 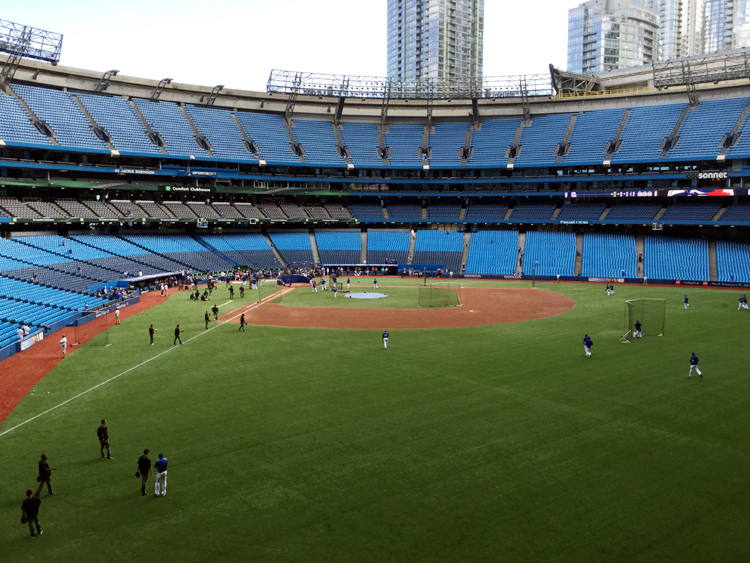 I wasn’t hoping to top Day 1 on Day 2, which would again feature Toronto hosting the Chicago White Sox. 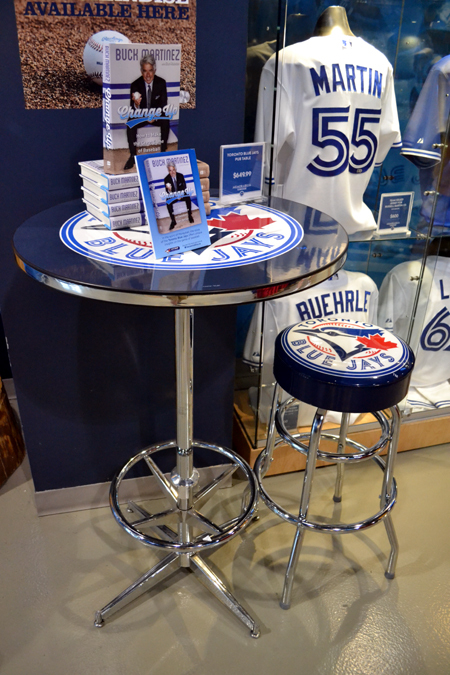 Instead, my priorities were to write the giant entry you might’ve previously read, wander around my hotel a bit more and enjoy the Jays game that night. To be honest, my photos hardly do the room justice. 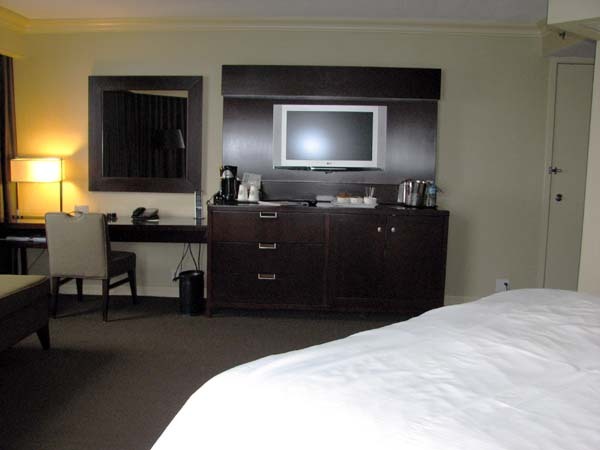 If you want to check out the hotel’s official photos, you can click this link. 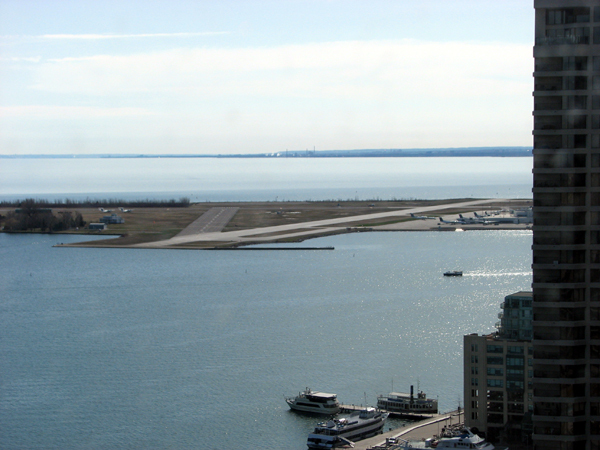 I’ll wrap up my thoughts on the Westin Harbour Castle by sharing a few final points. 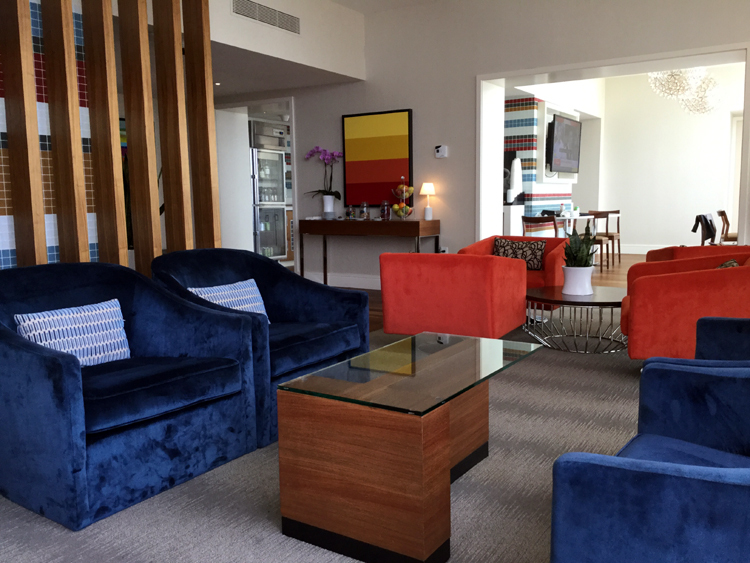 It’s certainly one of the top couple hotels I’ve ever visited, and everything about the stay was remarkable. The view and room were wonderful, of course, but the professionalism and courtesy exemplified by every hotel employee I met was notable. 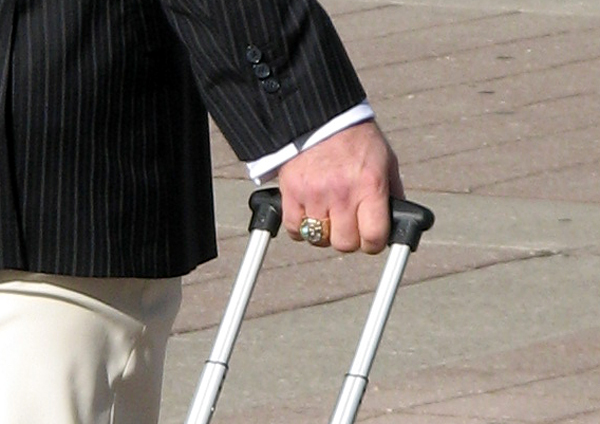 At some hotels, the front-desk clerk acts inconvenienced when you check in. 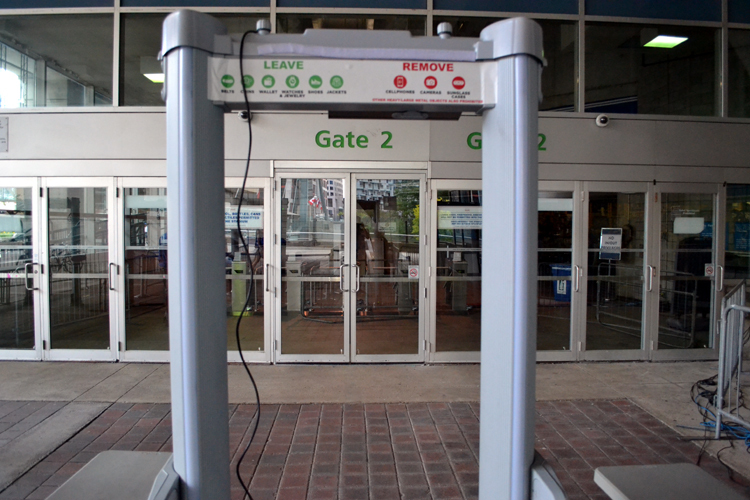 Here, I was greeted warmly by everyone I met and truly made to feel special. 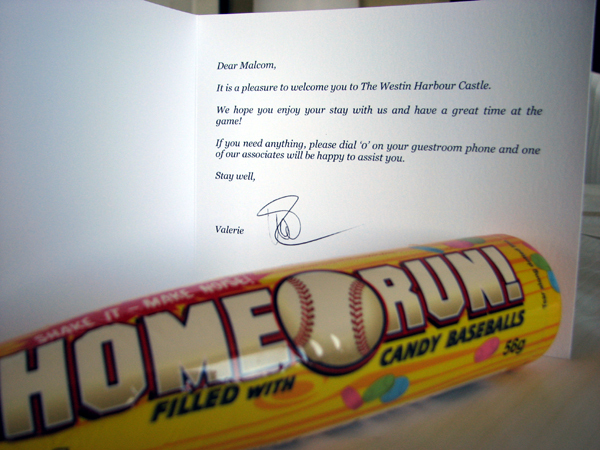 The Westin Harbour Castle will unquestionably be the hotel I pick during my next visit to Toronto, whenever that may be. 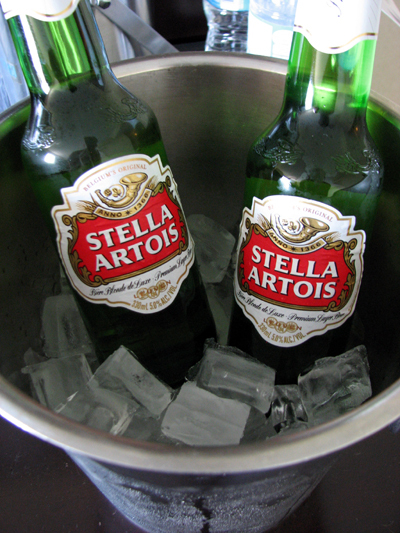 I strongly encourage you to make the same choice. A special thanks to Valerie, Bin and Emile for taking the time to say hello and ensure my stay was a perfect one. 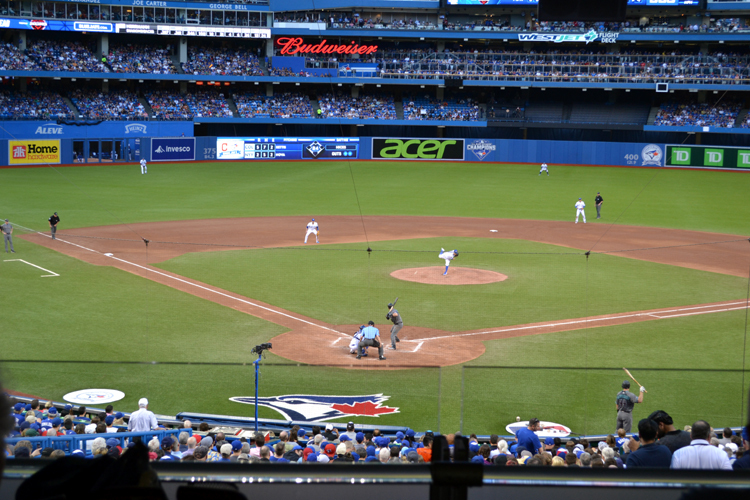 In fact, if you plan to visit Toronto this year to watch the Jays in action, there’s an extra reason to choose the Westin. 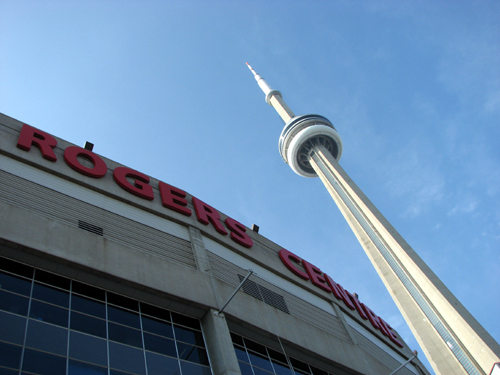 Buy your event tickets in advance and when you call to make a reservation between now and September 2, 2013, mention that you’ve got tickets to a game and you’ll get a special rate as part of the hotel’s Special Toronto Events and Sports Games Offer. 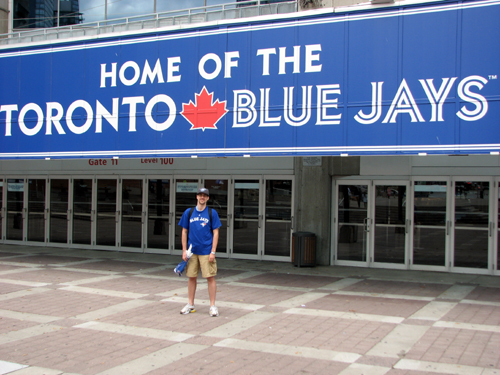 All in all, it was two awesome days for me and I’m glad to have visited Rogers Centre again. 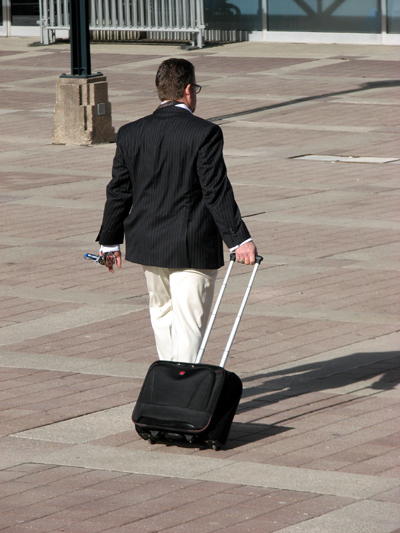 My next trip will be the opposite of a quick two-day event to familiar territory. 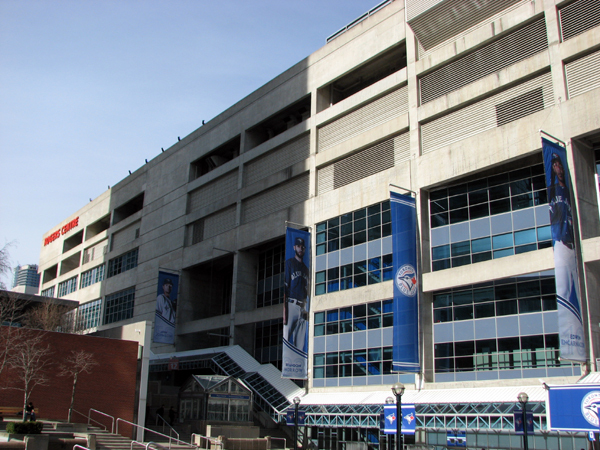 I’m just putting the finishing touches on it, but I can tell you it will likely begin May 17. I’ll have details soon. Thanks for reading! 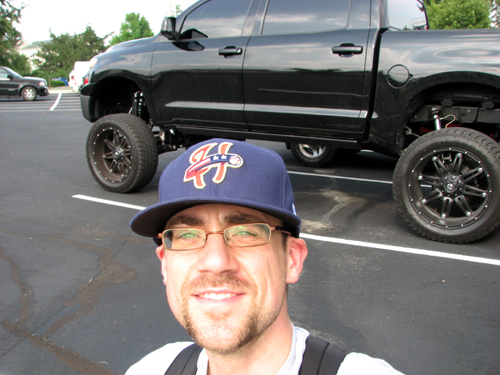 With the exception of being away from home, I love everything about my baseball road trips. 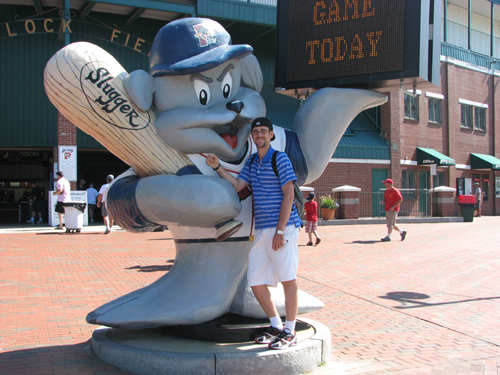 The ballparks and games themselves are the focal point as I continue to build The Ballpark Guide, but my trips are often full of other fun adventures, like doing interesting touristy things and staying in cool hotels. 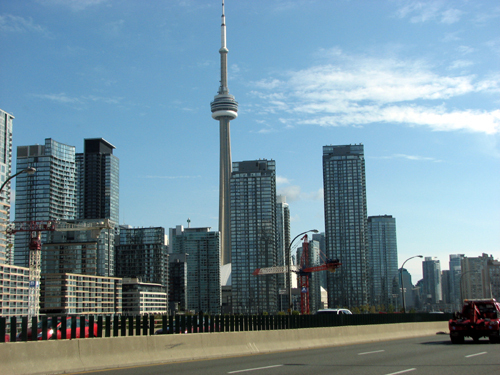 I’ve driven to and from Toronto countless times, so when I got up at 6 a.m. yesterday to get ready for my second baseball game of 2013, I decided I wanted to get to the city quickly, rather than do some sightseeing along the way. Why? I can’t deny that I was excited for last night’s game, but I was super excited to check out my hotel. 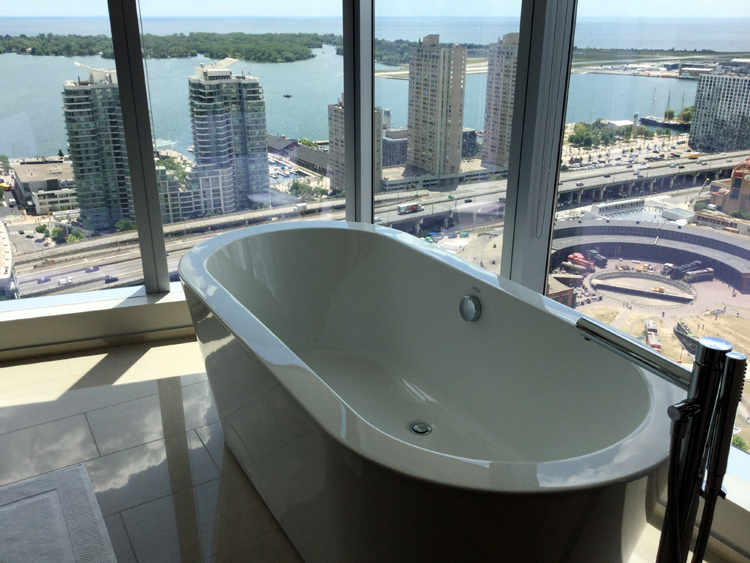 I love staying in hotels, and from the minute I booked a two-night stay at Toronto’s Westin Harbour Castle, I was pumped to check in. 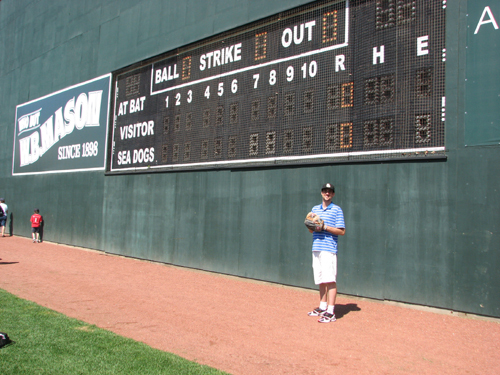 I’ve heard about this hotel for years and have always heard it to be a prime spot for baseball fans. Now that I’m here, I can definitely confirm this sentiment. 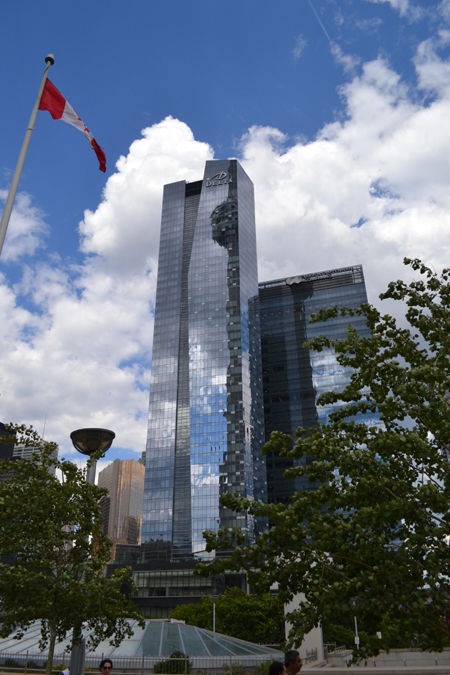 The Westin is one of Toronto’s nicest hotels and has a prime location right on the shore of Lake Ontario. 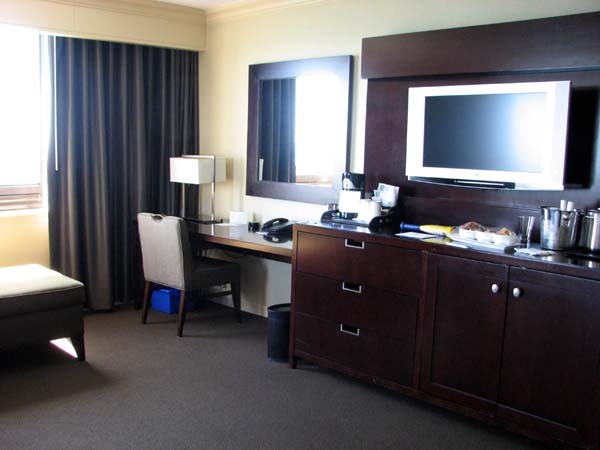 It’s just a short walk from a number of downtown attractions, which is ideal because parking downtown is expensive and driving downtown can be a hassle, given traffic and the permanent construction in the city’s core. It was easy to find my hotel, though, and I’m rather directionally challenged. It’s just a couple minutes off the highway and before long, I was parked and checking in. 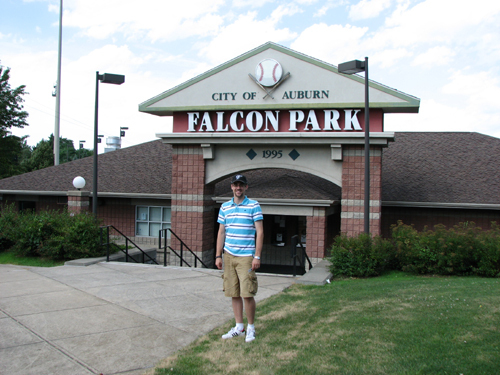 As far as the nearby attractions, they’re too many to list extensively. If you’re into fine dining, for example, consider the Westin’s restaurants or take just a short walk to hit dozens of area eateries. 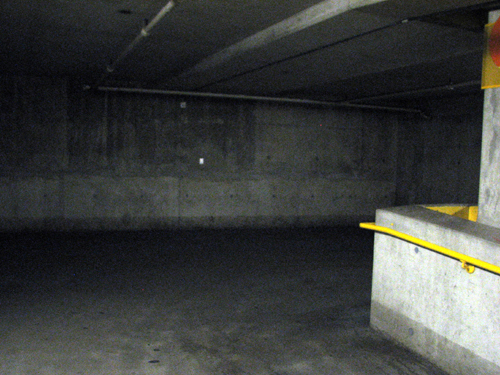 There are also at least two grocery stores about five minutes away if you want to load up on snacks for your room. One thing I did before visiting was check out the hotel on Google Maps, and just scroll around a bit to see what’s in the area. 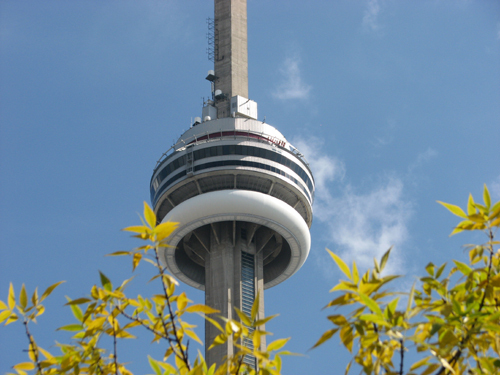 If you want to do the touristy thing, the CN Tower, Hockey Hall of Fame and all sorts of shops are just a short walk away. 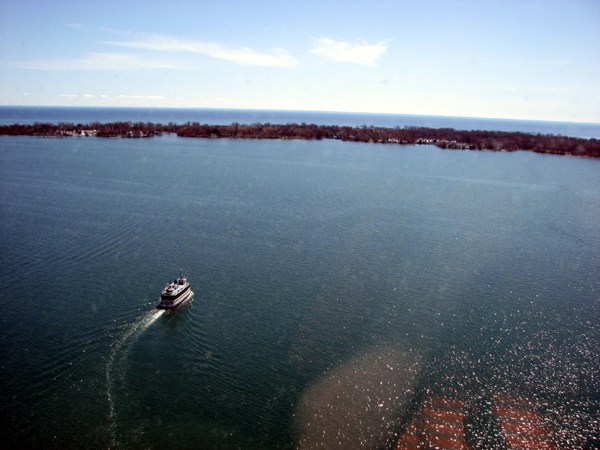 You’re looking at a ferry taking people over to the Toronto Islands, a group of islands just a stone’s throw from the city’s downtown. 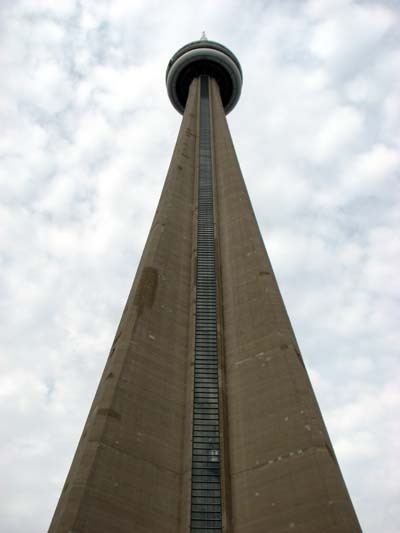 As a side note, I went over to the islands once — during a Grade 8 trip to Toronto with my school band to play the anthems at the SkyDome. 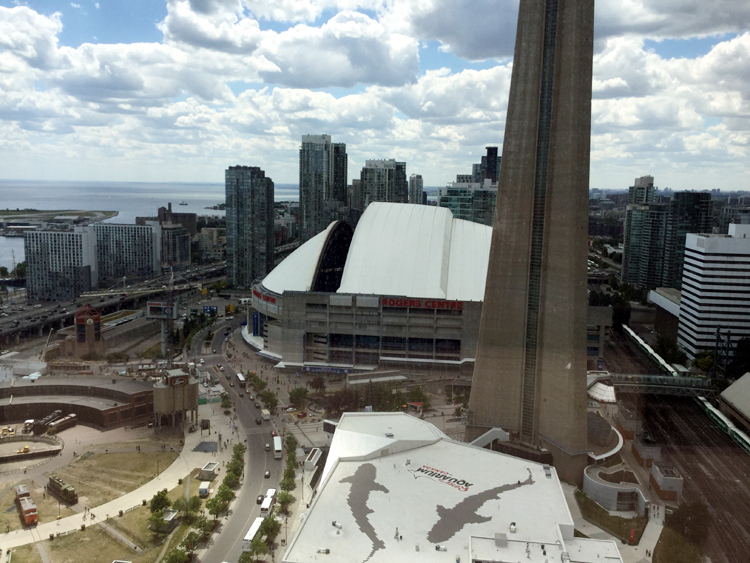 The spot that we boarded the ferry is directly below my window here at the Westin. 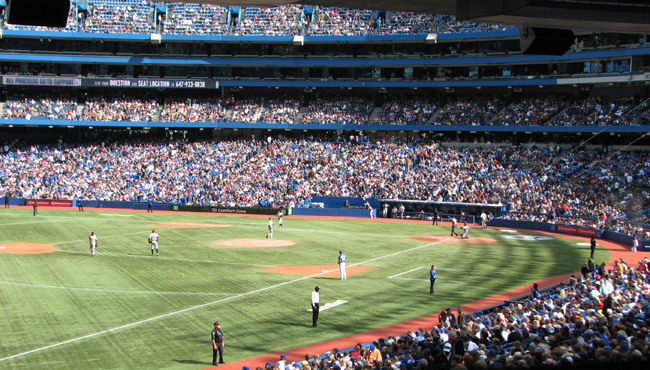 And here’s another side note that baseball fans will enjoy — in 1914, Babe Ruth hit his first professional home run at Hanlan’s Point Stadium, a ballpark on the island. 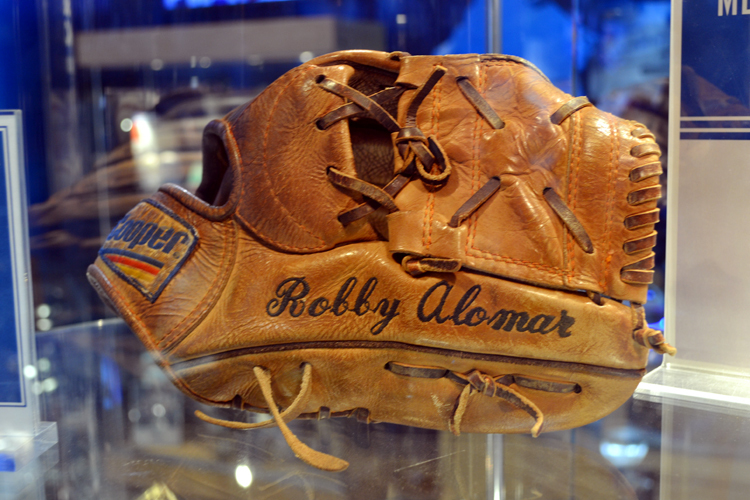 He was playing Double-A ball at the age of 19 and was still a half-decade away from tearing up Major League Baseball. My room is about 400 square feet, which is significantly larger than my first apartment. Since I’m staying here two nights, I’ll get to more details about the room and the hotel in my next blog post — I’ve still got some exploring to do! 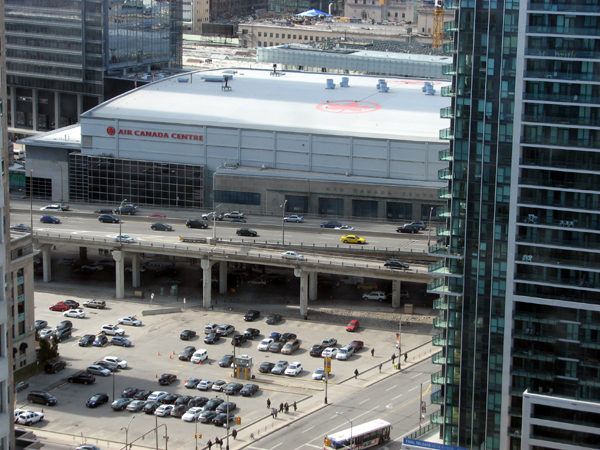 As you can see, I’m right across the street from Air Canada Centre, which is home of the Toronto Maple Leafs and Toronto Raptors. What a view! 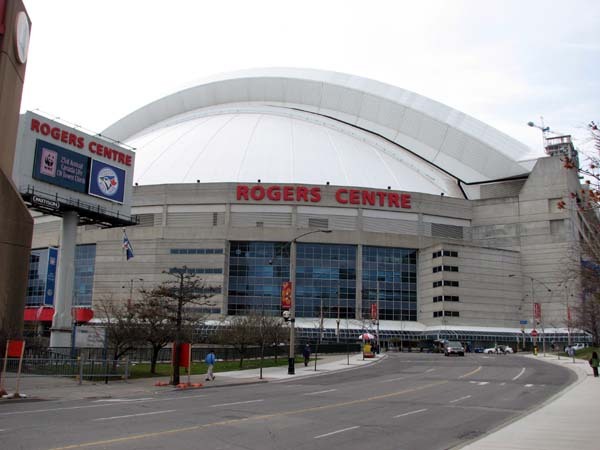 Soon enough, I made the short walk over toward Rogers Centre. The walk took about 15 minutes; you could do it in less time, as much of that time was spent waiting for street lights to change. 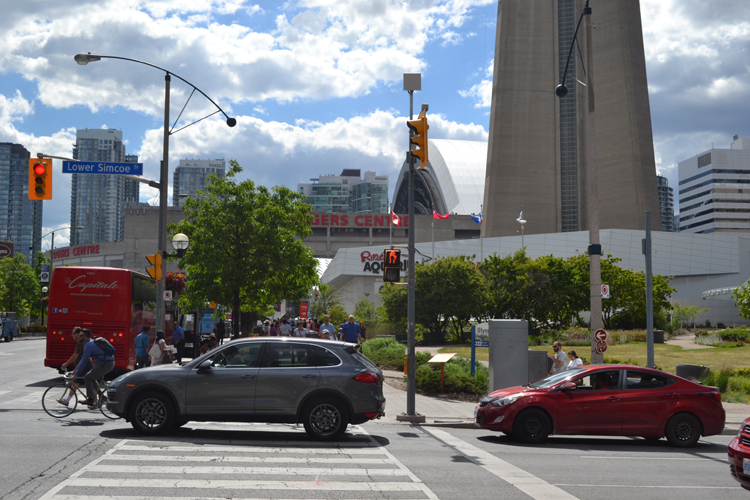 It’s a nice walk and if you’re new to the city, gives you the opportunity to walk past the ACC and Toronto’s historic Union Station, as well as walk in the shadow of the CN Tower. 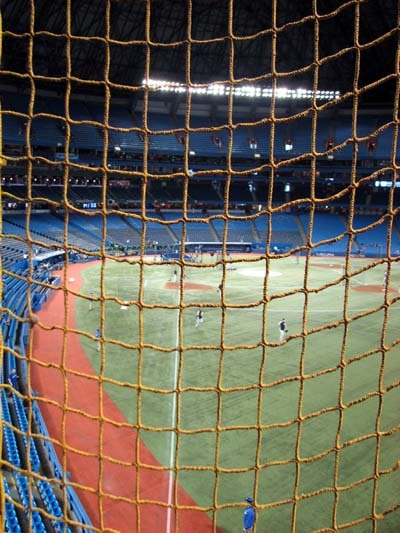 … I can’t help but recall visiting Rogers Centre (then known as SkyDome) in 1989 for my birthday party. 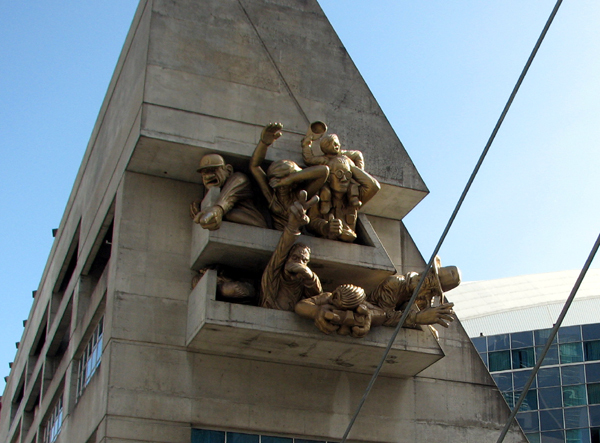 I remember thinking the statue, for whatever reason, was the coolest and funniest thing ever. 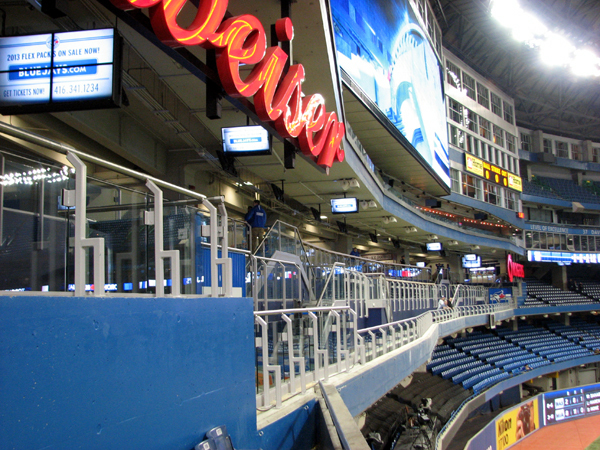 I’ll have more photos of it later on, but it’s the structure with the railings between the Budweiser and Rogers logos. 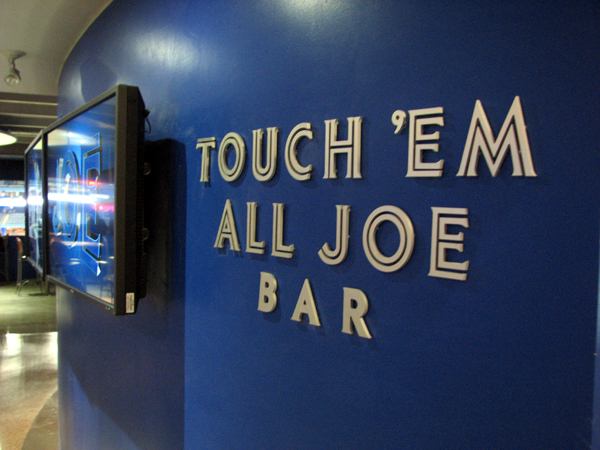 It’s free for anyone to enter, has nearby bars and a souvenir stand and, most importantly, has three levels of standing room. 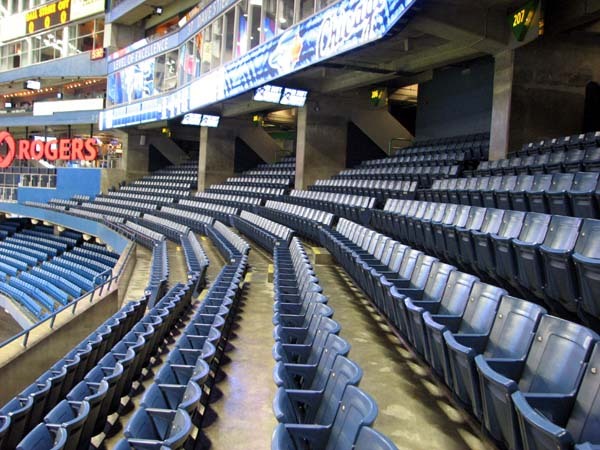 I figured that given its new popularity, it would be packed during the game. 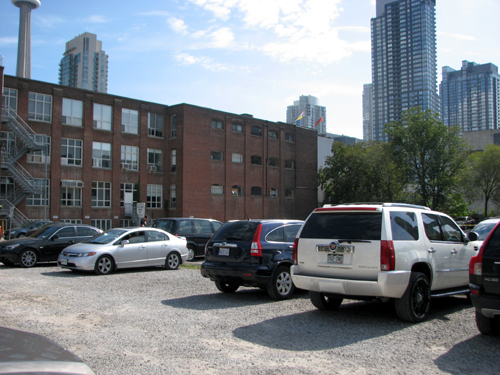 It was, but it was never packed enough that I couldn’t get a spot when I tried. As you can see, there are three levels, tables and a number of sections have wooden bars for your food and drinks, or just to lean on. It’s a perfect spot. After making one complete circuit of the 200 Level, I went down the ramp to check out the team shop. 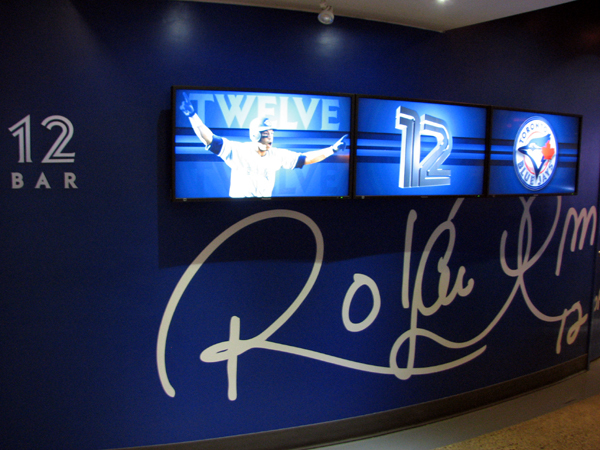 As I mentioned last year during my Rogers Centre visits, the new Memorabilia Clubhouse section is absolutely amazing. 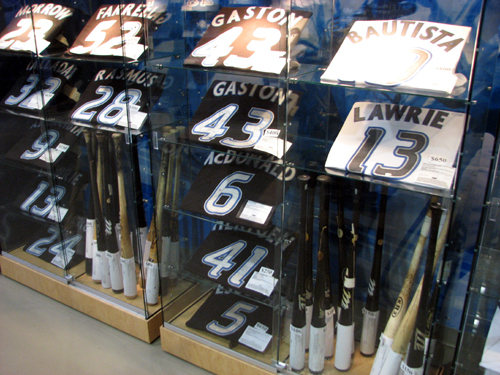 It’s full of game-used and game-issued stuff, and the only disappointment was not seeing the club’s two World Series trophies, which were on display here last year. 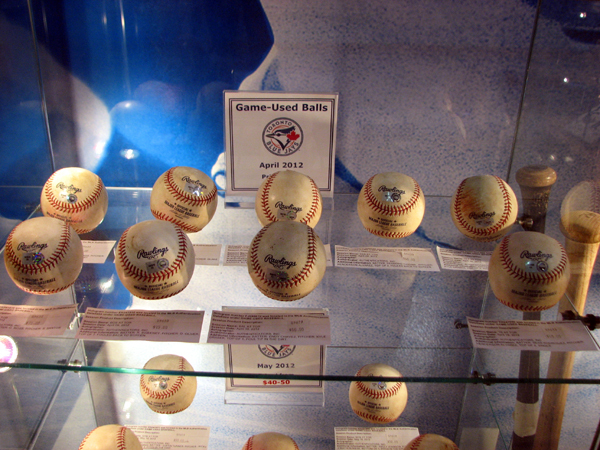 And other neat things, too. 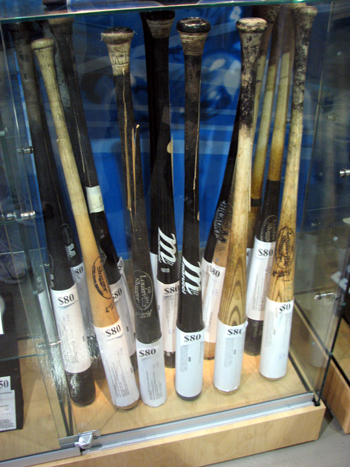 Did you know that for just $800, you can get a broken Jose Bautista bat? 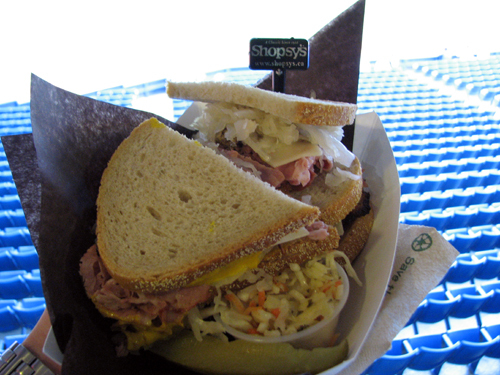 After buying my food, I often grab one of the many folding chairs stacked up around the 100 Level and eat while watching the game through the railing. 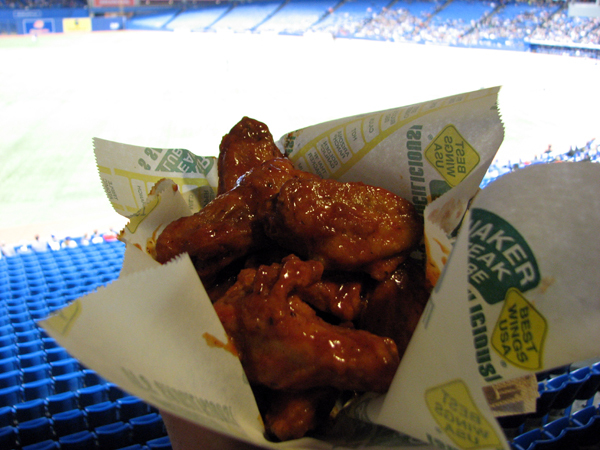 It’s a perfect strategy if you have a 500 Level ticket, as there’s no way you’ll make it up to your seat while your food is still remotely warm. 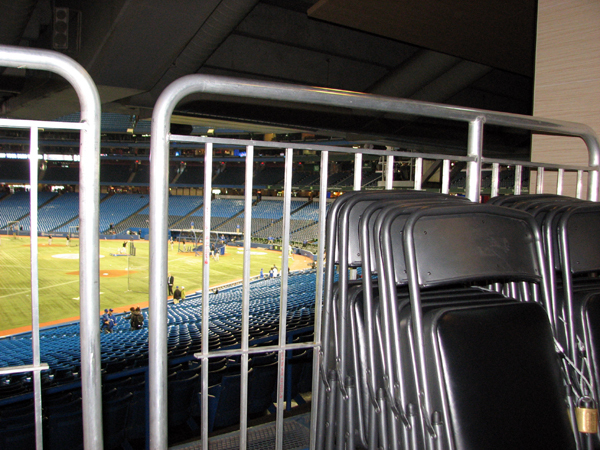 I’ve done this for years, but this year, I was dismayed to notice that the chairs are locked up — see the padlock? 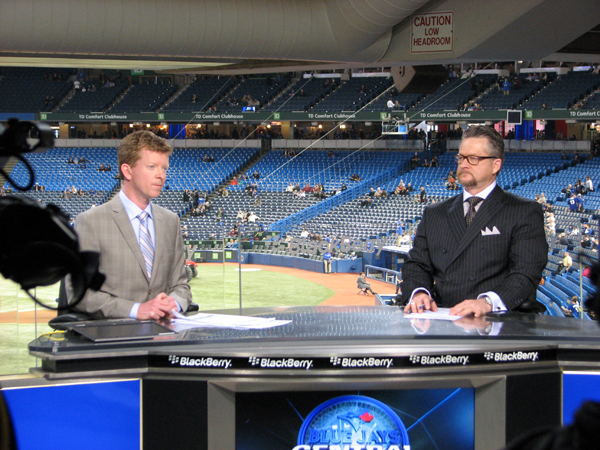 Game broadcasts nowadays are so good that it’s easy to feel at a slight loss for information when you attend games in person. 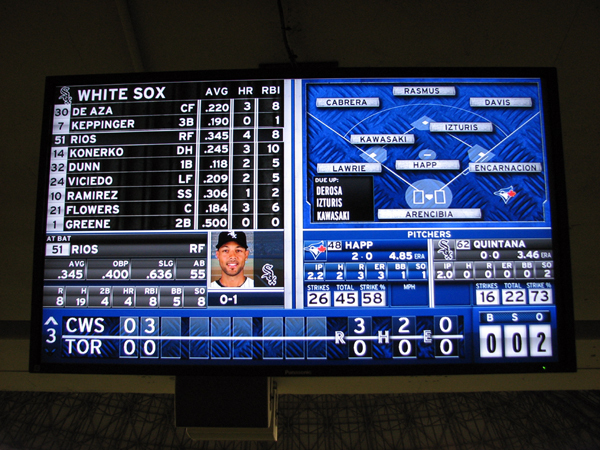 Being able to watch the live game while consulting the screen for stats was baseball heaven! 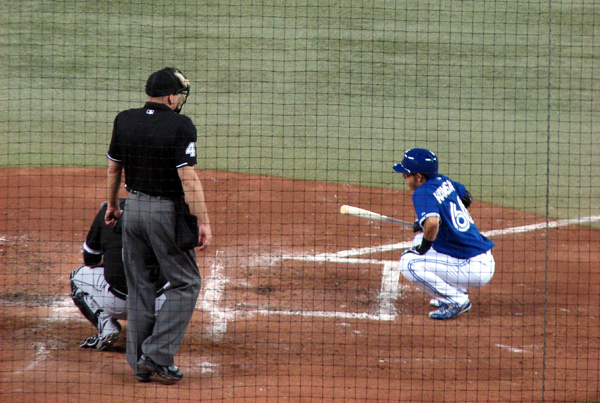 Late in the game, I decided to watch an inning or two from the concourse behind home plate, partly to watch Kawasaki. 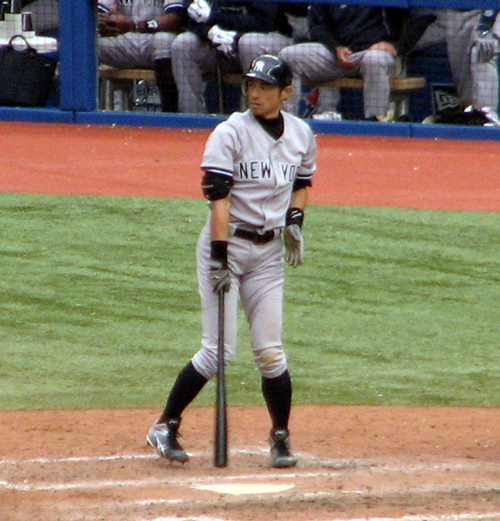 He’s a slap hitter who reminds me very much of Ichiro — and it’s not just that they’re both from Japan. Both have an insane dedication to stretching and calisthenics. 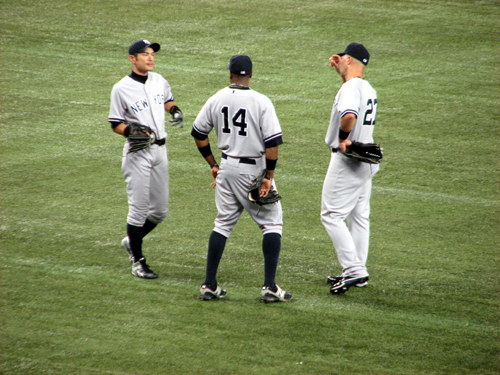 Both guys routinely stretch between pitches while at bat and while in the field. 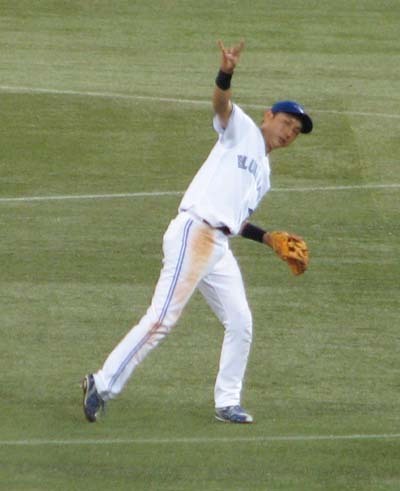 At one point, the Jays showed a video of Kawasaki performing a handstand during pre-game stretching. 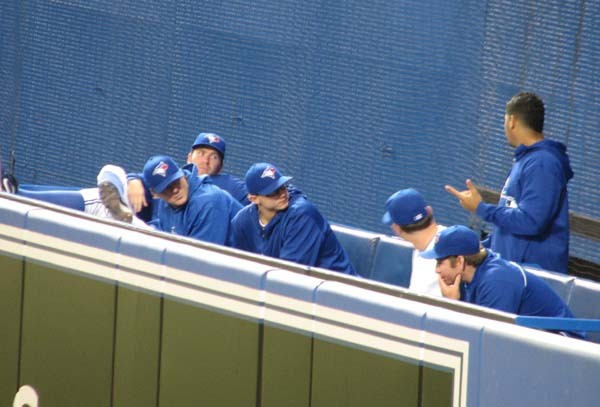 As for the stretching, see what I mean? 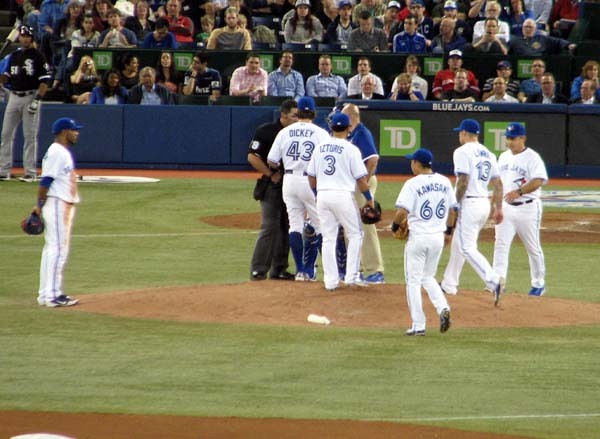 I spent up until the middle of the ninth inning up in the 500s, and then slipped down to the 100 Level concourse to watch the Jays’ last at-bat. 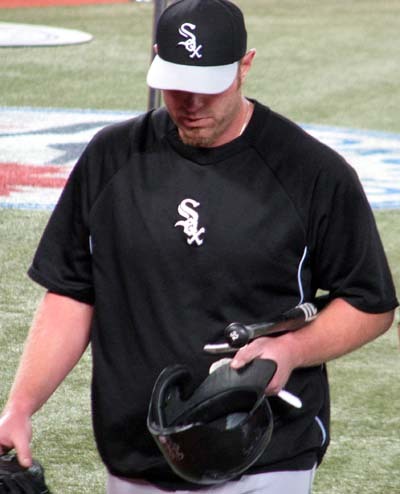 The Sox had tacked on two more runs to make the final score 7-0, which drops Toronto’s record to 6-9. 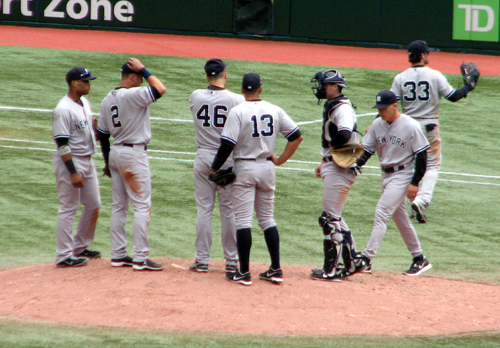 What a disappointing start to the season. Fans are already panicking, and while that’s a little premature, it’s frustrating to see the team faring so poorly early on. 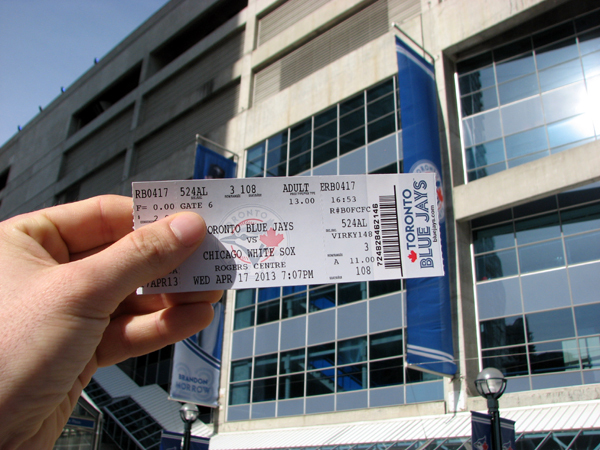 Nevertheless, I’ll be back at Rogers Centre for the final game of the series against the White Sox, and I can’t wait. 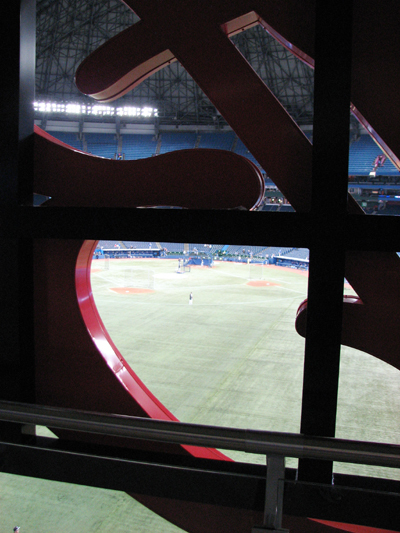 I’ll be blogging about the game, and more about my stay at the Westin Harbour Castle, in the next day or two. 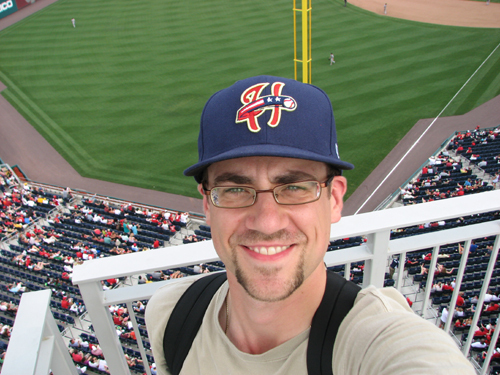 If you’ve recently found this blog, please consider following me on Twitter to keep up to date with all my road trip plans and visit The Ballpark Guide. 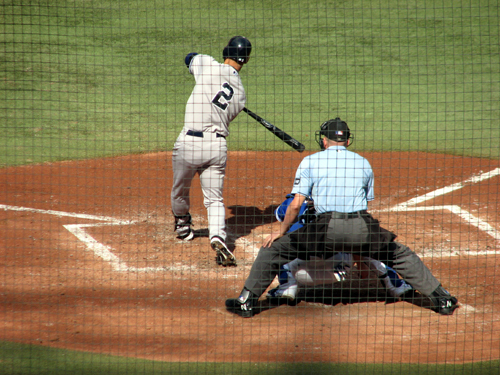 If you’re planning a baseball road trip of your own, my website has a ton of tips to help you make the most of your ballpark visits. 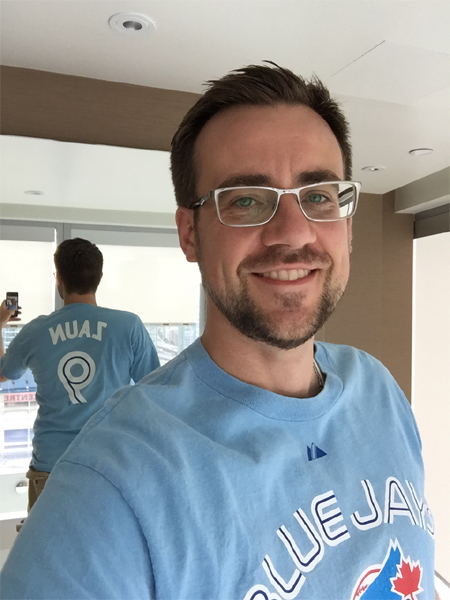 If you find that my website has saved you a few bucks or increased your enjoyment of the game — or if you just enjoy reading about my travels, please consider making a small donation to help the cause. Thank you! By now, you may have read my blog post about my first two chilly games of the year at Syracuse’s NBT Bank Stadium. If not, feel free to check out the ginormous blog entry about that amazing day here. 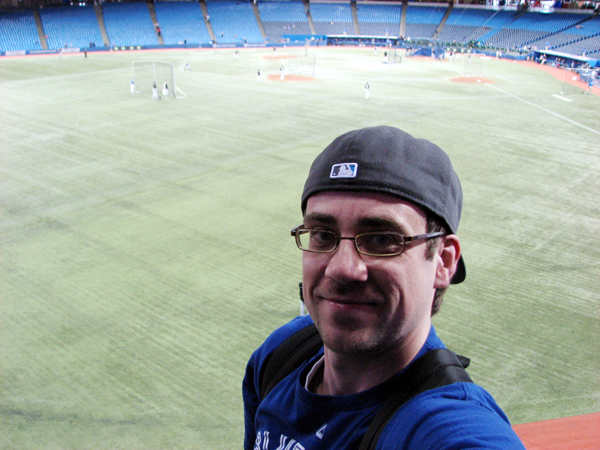 For those who’ve followed this blog for a long time, you’ll know that I’ve visited Rogers Centre a number of times. 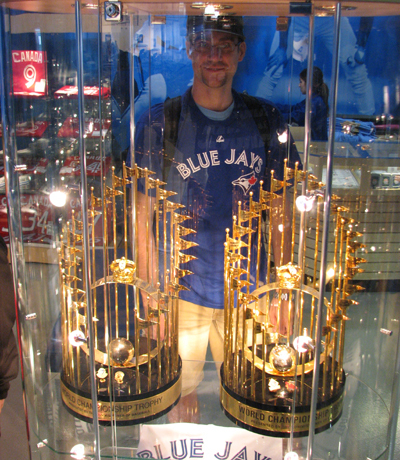 I’ve been a Jays fan since I was old enough to understand baseball and Toronto is the closest MLB city to me by far. 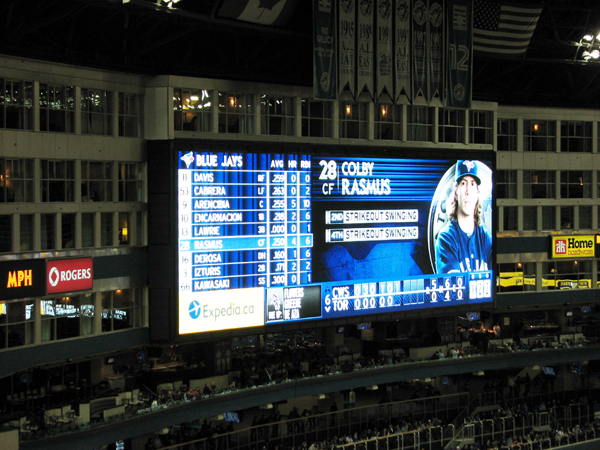 In fact, since I started The Ballpark Guide, I’ve watched the Jays play at home six times — twice in 2010, twice in 2011 and twice again in 2012. I’m glad to keep that streak intact. 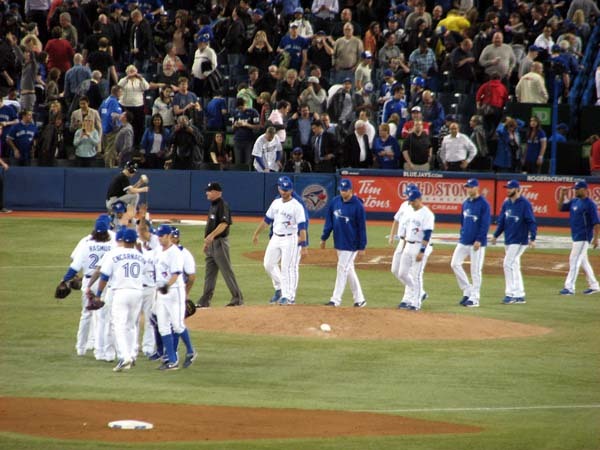 If you’re curious to read my blog entries about those games, check out this link and look for the Rogers Centre posts. 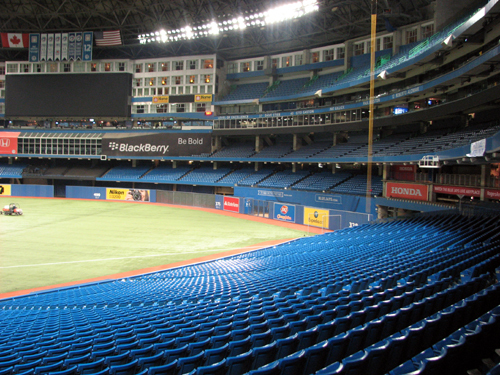 I’m excited to get back to Rogers Centre this year to not only check out the exciting, new-look Jays, but to also document all the off-season changes at the park. 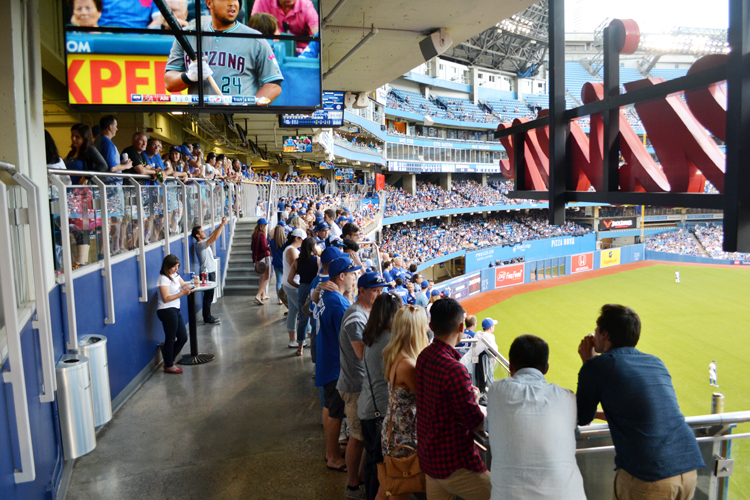 Sure, any given park changes a bit from year to year, but as you probably know if you’ve been watching the Jays on TV, there’s an awesome standing-room area in the outfield in what used to be the Windows restaurant. 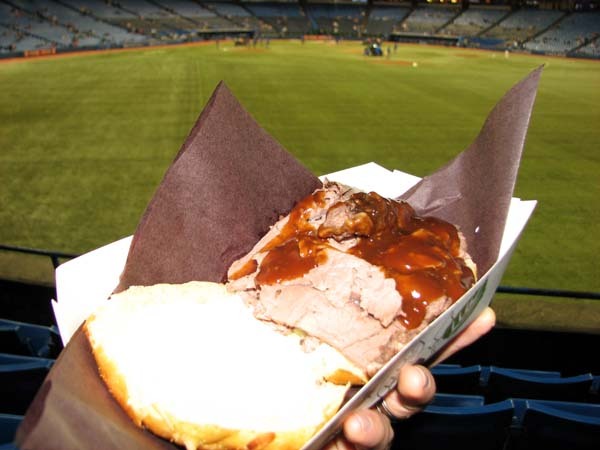 Sampling delicious food is a big part of the baseball experience for me, and given that the Jays have sold two of the 10 best things I’ve eaten on my travels, I’m excited to see what other tasty treats I can find. 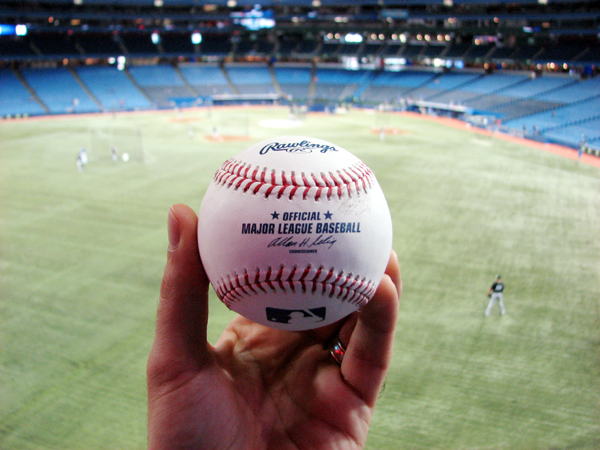 I’m also pumped to try to catch a ball during batting practice, take a ton of photos and, of course, blog all about it here. 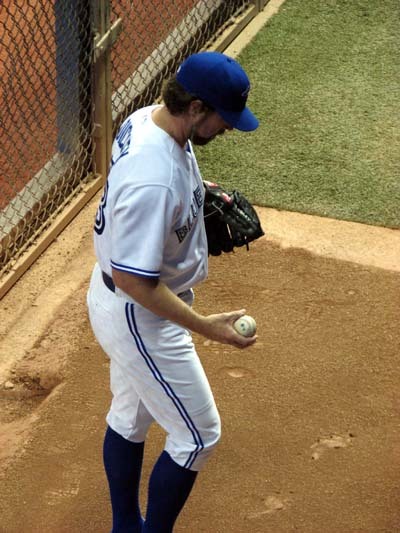 As an added bonus, I’ll get to see R.A. Dickey pitch during the second game of my trip, too. 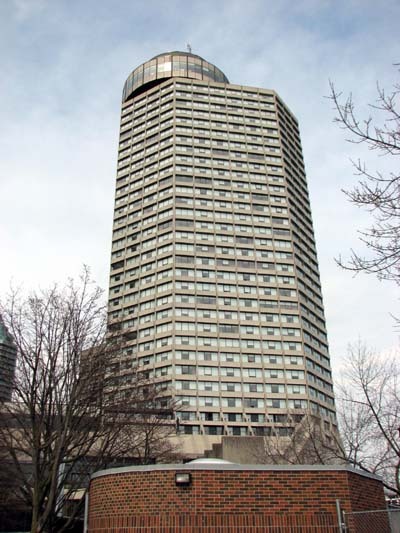 I’m also going to be staying in one of the city’s nicest hotels, and can’t wait to check it out and share those details, too. 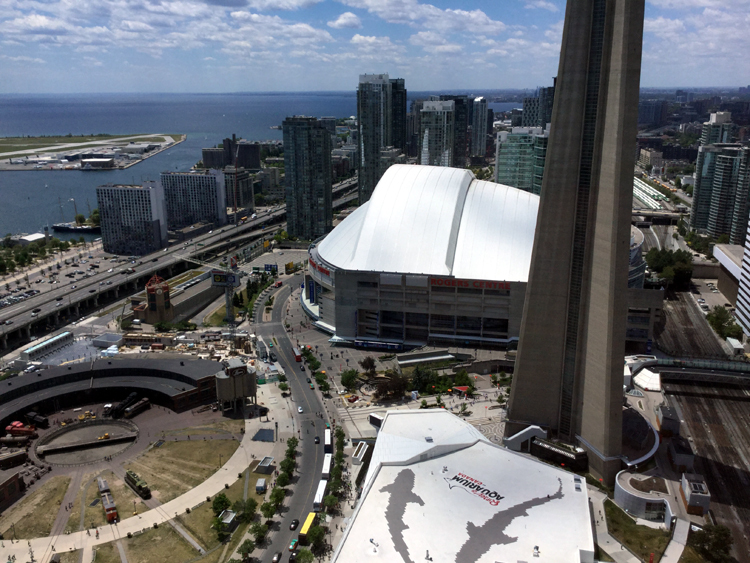 Its location promises to provide some outstanding views, so I’m pumped to see what it’s like. I don’t want to give away too much now, but I’ll have some details about it in my next blog post. 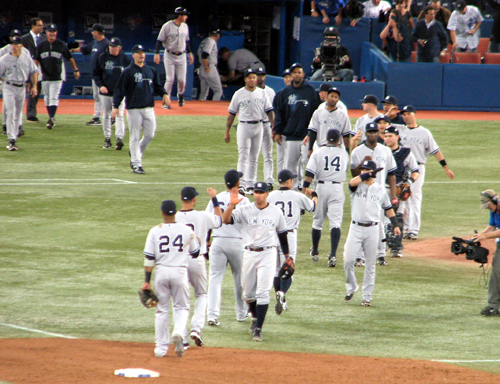 I’ve got one more baseball game from the summer of 2012 to write about. 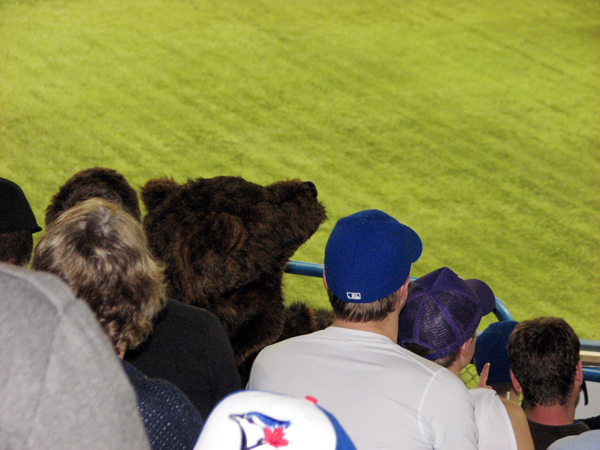 Like last year, I took a bit of a hibernation after the baseball season was over. It’s nice to take a break from things and I always find that in November, my website and blog traffic dip considerably. But, never fear! 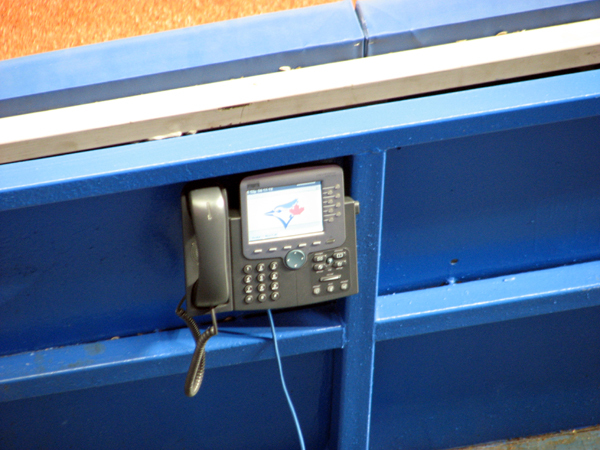 In addition to this post about my last game of the year, I’ve got a ton of off-season posts to fill the weeks between now and Opening Day. 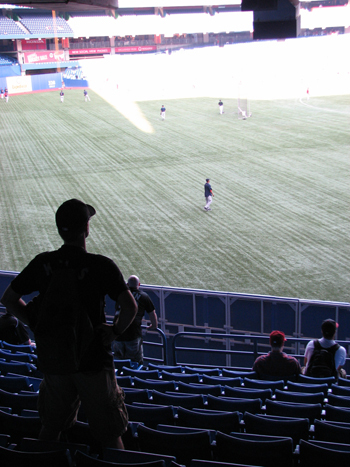 We then took a long walk around the entire outside of the stadium. This is something I usually do, but this time, I took a photo every few steps. I’m in the process of making all the photos into a slideshow/video that I’ll soon post on my YouTube channel, so watch my Twitter account for that. It’s looking pretty neat. 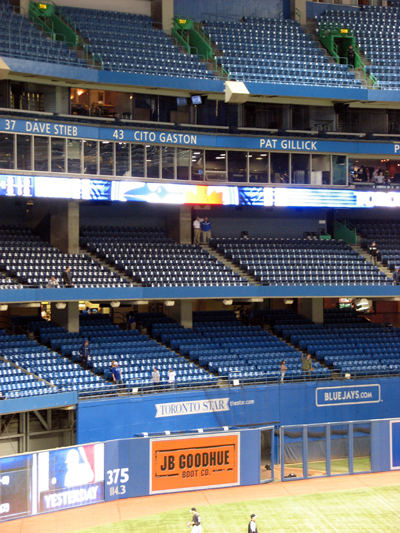 If I’m going to buy a ticket and actually sit in that seat at Rogers Centre, I like the 100 Level outfield seat. 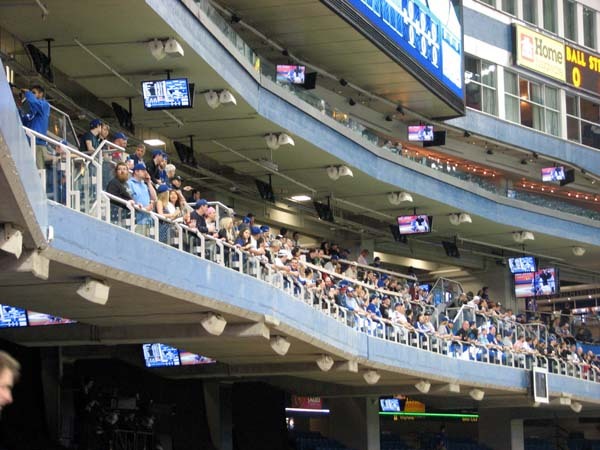 The tickets are expensive given how far you are from home plate, but the sections toward the batter’s eye are sparsely populated, which allows you to stretch out. 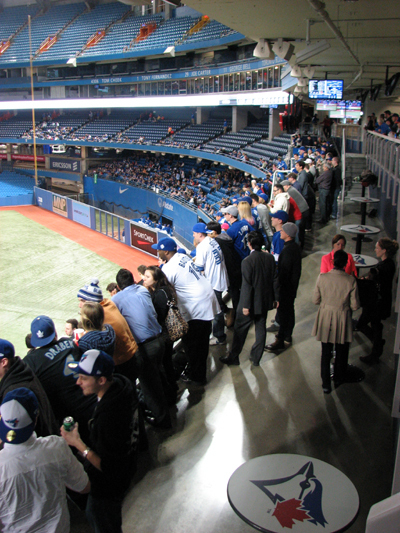 Come to think of it, we had a good run-in with an usher, as is the norm in Toronto. 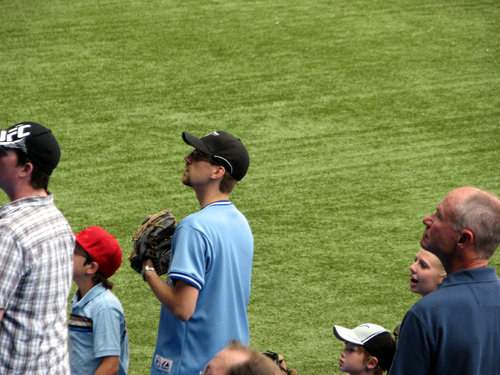 Our tickets were on the aisle in section 140, but given that that particular area was crowded, we moved over into section 141, which was mostly empty. Instantly, an usher swarmed in on us and I flashed my ticket to show that while we weren’t in the right section, we were still in the correct price range. No big deal, right? His response? “OK, but the second I see you acting up, I’m gonna make you go over the other section right away.” My brother actually laughed right out loud, and the usher scurried back to his usual standing spot to continue thinking about Dungeons and Dragons. Or at least that’s how he seemed. 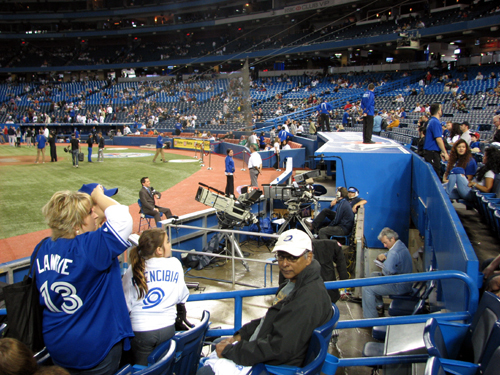 I met Gose and got his autograph last year in New Hampshire, so it was neat to see him as a Blue Jay in person. As always, thanks for reading, and please follow me on Twitter for updates throughout the off-season. I’ve got a huge list of things I’ll blog about, including entries about my souvenirs from the summer, highs and lows, an updated top 10 food list, apparel I bought, a rundown of my press passes, and much, much more. I’ll also be sharing plans for 2013 road trips, because they aren’t that far away. 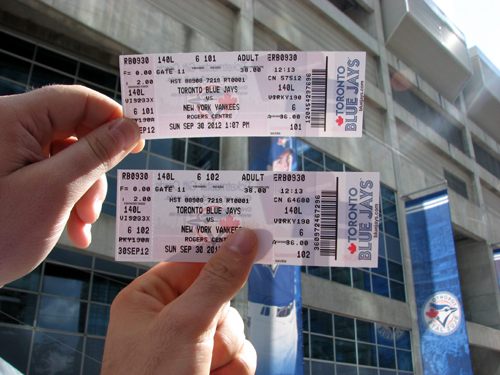 Every fall, my brother and I take a road trip to watch an NFL game in a different city. 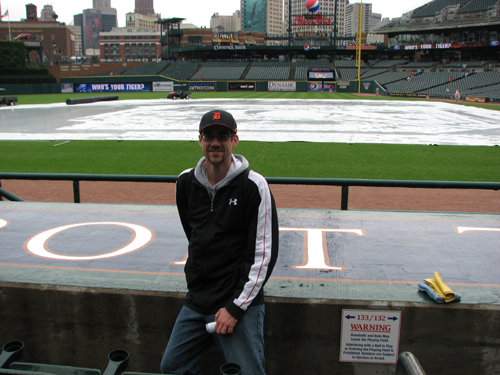 We started the tradition a few years ago, and so far, we’ve been to Buffalo, Detroit and Cleveland. 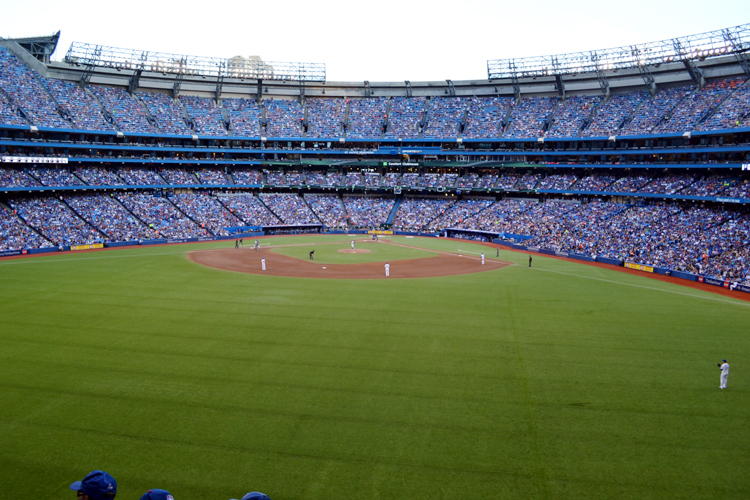 Where possible, we add a second sporting event to our itinerary, and I’m always pushing for a baseball game. 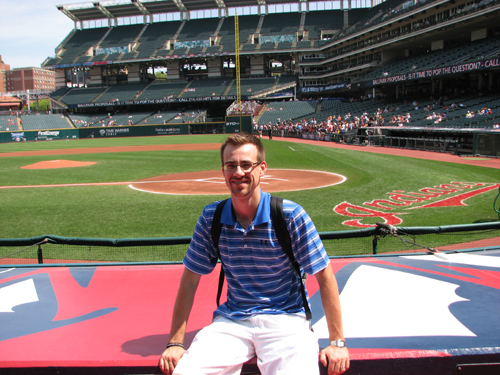 Last year, when we visited Cleveland to see the Browns, we also went to Progressive Field to see the Indians on Jim Thome Night. 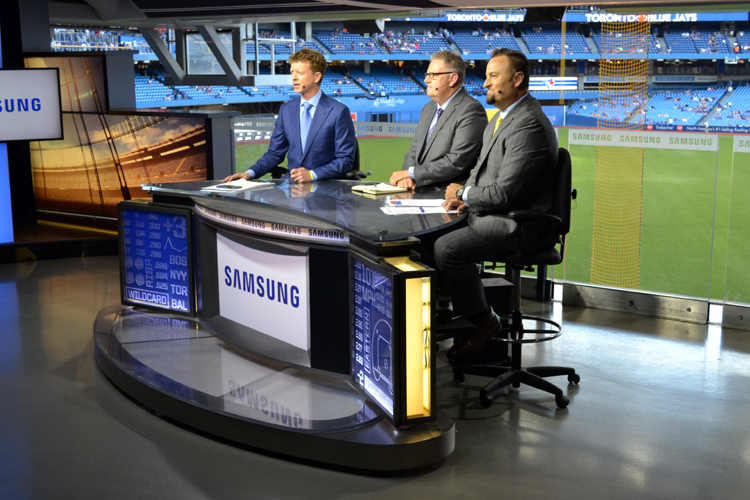 This year, driving to the U.S. to watch football didn’t work with our schedules, so we came up with a great alternative — two days in Toronto to watch the Blue Jays host the New York Yankees at Rogers Centre. 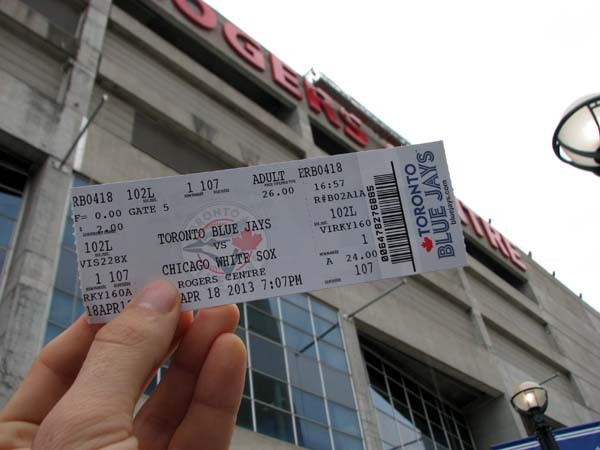 I saw the Jays twice last season, but hadn’t been to a game yet in 2012. 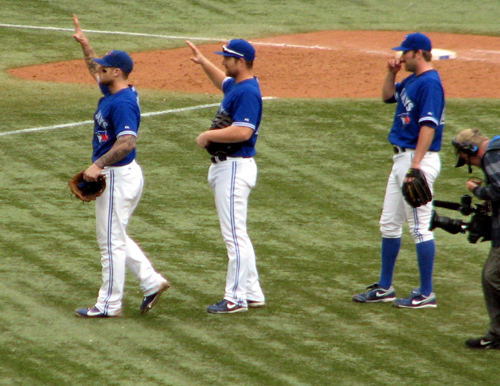 If my first Jays games of the year weren’t exciting enough, it was an added bonus to see the team in its new uniforms for the first time. 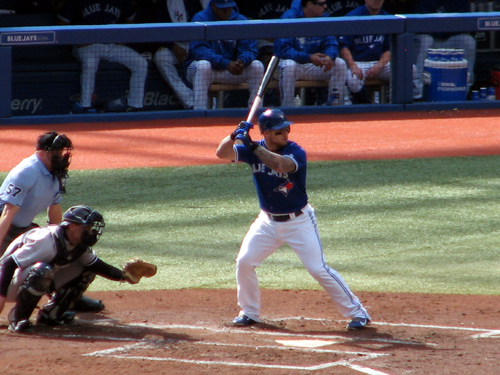 I finally found two larges — Brandon Morrow and Brett Lawrie, and opted for the latter. I’ll have a photo of that shirt in a later blog entry, but you’ll also see me wearing that shirt in this post. I didn’t buy anything at the time, but I picked up something very cool for my collection the next day, and I’ll blog about that later on. 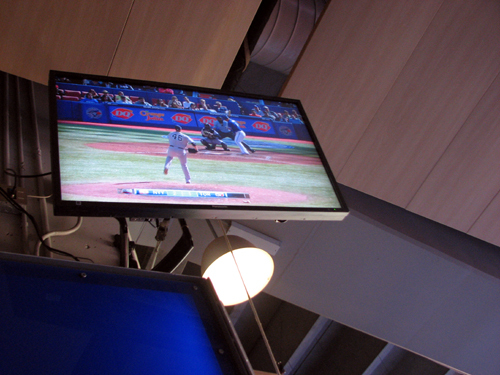 After the top of the first inning, we decided to grab some food and find another place to sit. 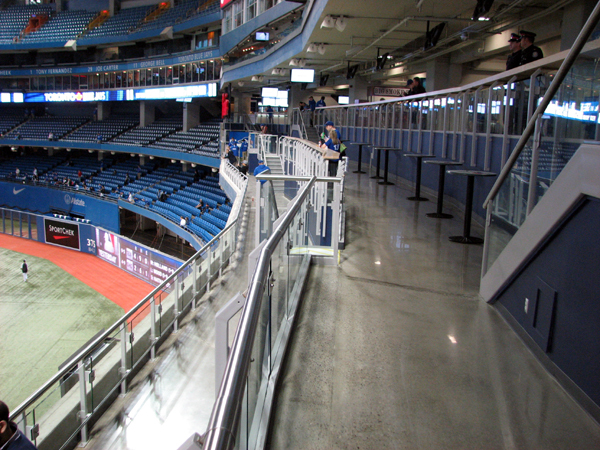 We’d bought 500 Level tickets for the game, but I shared one of my patented Rogers Centre tricks with my brother — find a spot behind the railing in the 100 Level concourse, grab two folding chairs and watch the action from there. Now, I should say that I got special permission to take this photo. 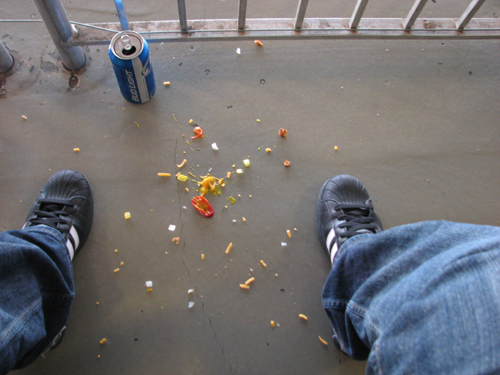 Me: Do you mind if I take a photo of the mess on the floor? You know, for the blog. Me: You aren’t worried that it’ll make you look, you know, like … a bit slobby? 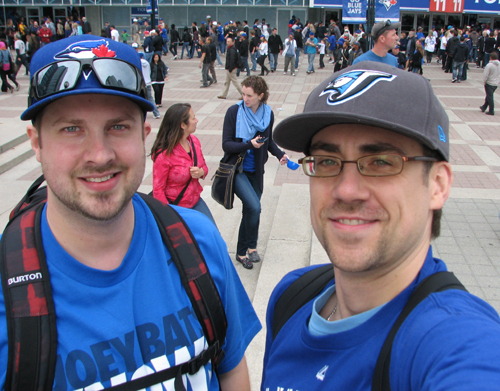 Less than 24 hours later, we were back at Rogers Centre to watch the Jays and Yankees again. I’ll have a blog post about that soon.